Position currently filled by casual employee to cover Holiday Program. Discussions yet to be held with funding authority regarding long term options. 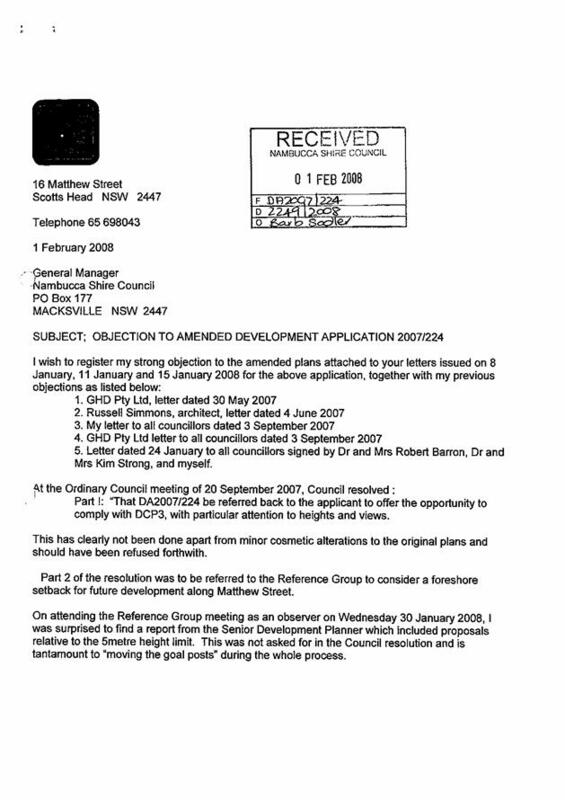 Report to Council 6 March 2008. Report as part of Management Plan and plant purchases. Spray regrowth after 300 mm growth. Planning Manager for Forests NSW contacted on 10/12/07. Letter seeking confirmation of arrangements sent 12/12/07. 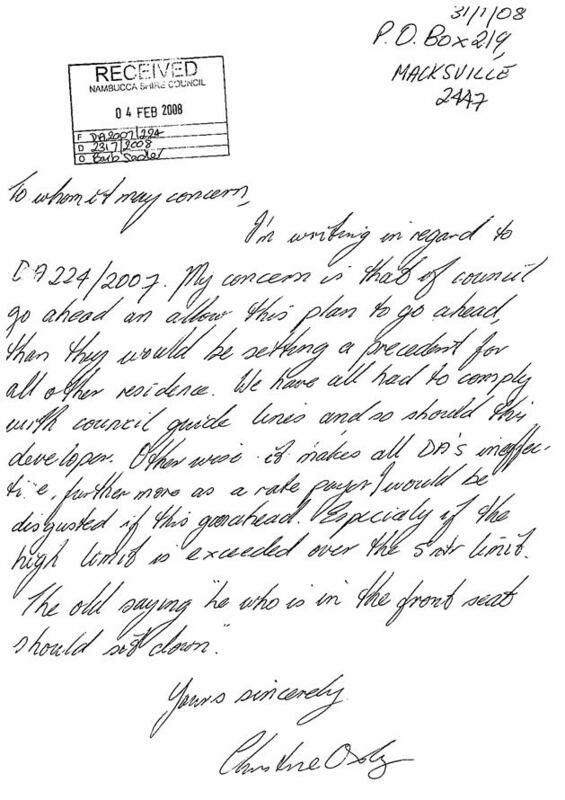 Follow-up letter sent 7/1/08. SAO telephoned 29 January. GM telephoned 8 February. With Forests NSW legal branch. Follow-up letter to be sent to the Minister. No tenders accepted. Soil testing underway. Grant advice in Feb 08 with selective tender to follow grant notice. Offer of $175,000 made on 22 February 2008. Individuals must protect their own property. Possible late report to 6 March 2008. The report canvasses legislation and guidelines relevant to CCTV. This sector of information technology has developed quickly and no specific information could be found in relation to the installation of promotional webcams. Typically the latter do not allow sufficient resolution to identify individuals. In summary, the quality of the images provided by the Bowraville promotional webcam does not allow it to be equated with the CCTV systems discussed in the State Government guidelines nor implemented by many Councils as part of their crime safety strategies. That the information concerning the guidelines for the installation of CCTV and the discussion about the Bowraville promotional webcam be received. The report is for information. The cameras (north and south) can be removed from the clock tower should Council resolve this way. Should this be considered it is suggested that the quality of the images be viewed first on www.bowraville.org.au. 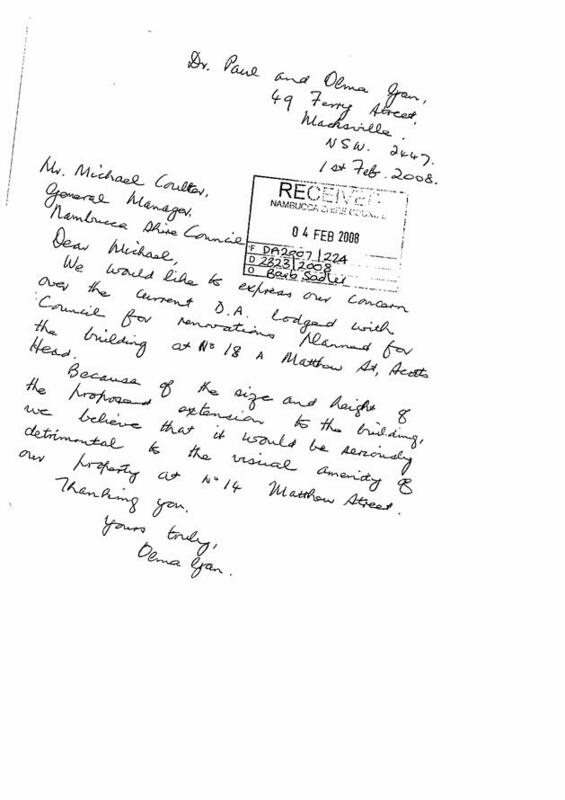 At Council’s meeting on 20 December 2007 there was a question without notice in relation to the Bowraville Lions Club using surplus funds of $2,000 to install, “CCTV cameras in the clock tower”. There was concern expressed that the action was undertaken without local community consultation or consent. “Given the cameras are monitoring a public space and broadcasting on the internet, did this development require Council approval? It was indicated that the requirements for public consultation and the legality of installing the webcam would be investigated. In 2000, the NSW Government issued a policy statement and guidelines for the establishment and implementation of closed circuit television (CCTV) in public places. At the time CCTV was relatively new and webcam was even newer technology. Whilst there is no effective distinction in relation to the technology being applied, in general the objective of webcams is not to undertake surveillance of people. There are hundreds of examples of webcams in Australia providing near live footage of beach conditions, snow conditions, river mouth conditions, traffic conditions, Sydney harbour, city skylines, streets, public places, buildings under construction, university life, airport movements, memorials, zoo attractions, weather, events and basically anything which people would find useful viewing in real time or which people would like to promote. Conversely, the objective of CCTV is to be able to observe people and motor vehicles at a higher level of resolution. Hence whilst CCTV can be effective in reducing or preventing crime, webcams would generally be of less use. Principle: The ownership of public area CCTV schemes must be clear and publicly known and ensure appropriate accountability. Principle: When considering setting up or significantly expanding a public area CCTV scheme, the relevant concerns of all parties potentially affected by the scheme should be taken into account through an effective community consultation strategy. Consultation will help ensure that schemes meet local needs and circumstances, and that the operation of the scheme has the support of those affected by it. Principle: Clear scheme objectives should be set to guide the design, implementation, management and outcomes of public area CCTV. A clear statement of objectives will provide a basis for effective monitoring and evaluation of the scheme, and help to ensure that the use of CCTV is consistent with overall crime prevention strategies. Principle: The implementation of CCTV should be part of an integrated, multi-agency approach to crime control and community safety. Principle: While the NSW Police Service should not fund or operate public area CCTV schemes, it should be closely involved in the assessment and planning phase, including risk analysis and evaluation. The Standard Operating Procedures for the scheme should incorporate protocols covering communication and liaison between the scheme operators and the police. Principle: Schemes should be open and accountable and operate with due regard for the privacy and civil rights of individuals and the community. Principle: Effective evaluation of schemes is essential in order to identify whether their formal objectives are being achieved. Evaluation frameworks should be developed at the planning stage of the scheme. Principle: Publicly accountable, impartial and fair schemes should have procedures for dealing with complaints. Principle: Audit is needed to provide an account of the operation of the scheme, by testing its compliance against relevant policy, legislation and procedures, and to be used as the basis of recommendations for improved practice. The guidelines proceed to set out the steps to be followed in planning and implementing a CCTV surveillance scheme in more of less chronological order. However as discussed above these would not seem to be relevant to a promotional webcam. 1. Identify that there is a crime problem which may be addressed by the introduction of CCTV. 2. Establish a community safety committee. 3. Conduct a crime assessment to identify more accurately what crime problems are occurring, where and when. 4. Consult with the community, including local businesses and other specific groups, especially on matters relating to privacy. 5. Develop a crime prevention strategy or community safety plan which includes the operation of a CCTV scheme. 6. Set objectives for the CCTV scheme and develop evaluation mechanisms. 7. Determine the roles and responsibilities of the key players, especially the local authority and the police. 8. Develop a code of practice to set the standards for and guide the operation of the scheme. 9. Develop and implement standard operating procedures. 10. Develop and implement ongoing monitoring and auditing mechanisms for the scheme. 11. Determine the technical requirements of the scheme. 12. Develop and implement a complaints mechanism. 13. Develop information strategies to inform the public about the operation of the scheme. 14. Install and trial the CCTV scheme. 15. Conduct an evaluation of the trial and its outcomes and disseminate the results to relevant parties. 16. Review the trial and its evaluation to determine the need for the CCTV scheme to be continued. A recent article in the December 07 edition of the Local Agenda magazine of the NSW Local Government and Shires’ Associations notes the tremendous growth in the use of CCTV by Councils. An increasing number of Councils have CCTV coverage of their CBD areas. Dubbo has installed a network of cameras in their CBD. Coonamble has installed 18 cameras in their CBD to address increasing malicious damage. Wollongong has 45 cameras in place in their Crown Street Mall with a further 40 cameras to be installed through the CBD. Sydney City Council funds CCTV to the tune of $1m per year in their Street Safety Camera Program. Lismore City Council has installed 19 cameras in their CBD as part of a CitySafe Program. In response to the question without notice the installation of cameras would not seem to be development requiring consent as set out in the Environmental Planning and Assessment Act 1979. There is other relevant legislation being the Privacy and Personal Information Protection Act 1998. This Act defines personal information as “information or an opinion about an individual whose identity is apparent or can reasonably be ascertained from the information or opinion”. This definition would include the video record made on CCTV as people filmed would in many cases be people whose identity is apparent or could be reasonably ascertained. An agency which holds such personal information cannot disclose it for a purpose other than for that for which it was collected. Again if the webcam is unable to discern individuals then it would seem there is no breach of the Privacy and Personal Information Protection Act 1998. In summary, the quality of the images provided by the Bowraville promotional webcam does not allow it to be equated with the CCTV systems discussed in the State Government guidelines nor implemented by many Councils as part of their crime safety strategies. Should the community seek CCTV systems for use as part of a crime prevention strategy, then the steps outlined in the State Government’s guidelines would need to be followed. There has been consultation with the Manager Planning and Assessment. The protection of privacy and personal information is important. If a person’s identity is apparent then Council would be subject to the provisions of the Privacy and Personal Information Protection Act 1998. There are risks in collecting personal information and then in relation to the manner of its use. Following a decision by Transfield Services on behalf of the Rail Infrastructure Corporation to offer $88,500 towards the replacement of the Upper Warrell Creek road railway overbridge, there has been on-going lobbying about the unfairness of this offer and its blatant cost shifting. Council has been provided with some support from the Department of State and Regional Development but has not even received a response from the Department of Transport. The replacement of the bridge is critical to the proposed development of a pre-cast concrete manufacturing facility by Abigroup. The factory will provide direct employment for 50 people and has already attracted interest from other companies now seeking to establish in the industrial area. Abigroup have proposed to provide financial support to the bridge which can be expressed in the form of a planning agreement under the Environmental Planning and Assessment Act 1979. As further delay will jeopardise not only the Abigroup development but other associated industrial development, it is recommended that Council proceed with a design and construct tender for the replacement of the bridge. 1 That Council undertake an open tender for the design and construction of the Upper Warrell Creek Road railway overbridge and associated roadworks. 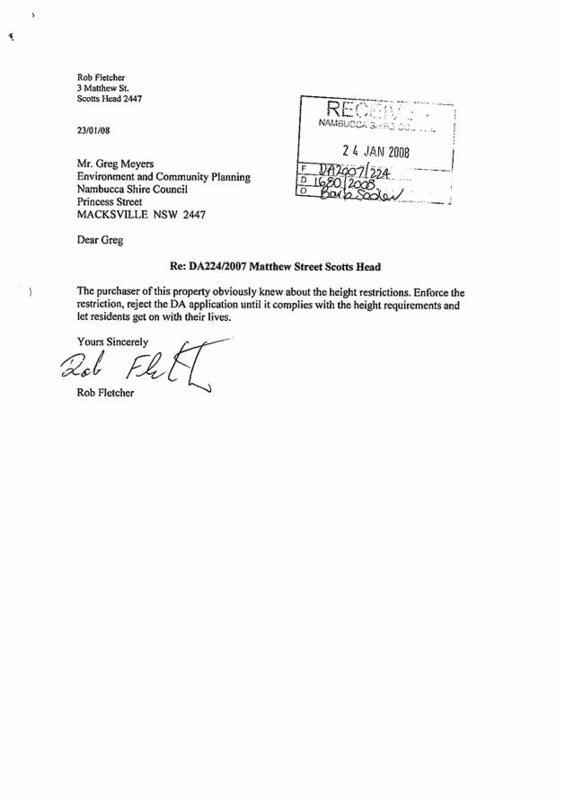 2 The tender documents be submitted to Transfield Services for their approval prior to advertising. 3 The tenders be reported to Council for determination. Council can opt to build the replacement bridge or not. If Council does not commit to building the replacement bridge, it is likely that the proposed Abigroup pre-cast concrete manufacturing facility will not proceed. Reference is made to previous representations concerning the Upper Warrell Creek Railway Overbridge and the development application for the proposed Abigroup pre-cast concrete manufacturing facility. To recap, there is a lengthy history of negotiation between Council, the Rail Infrastructure Corporation (RIC) and the Federal and State Governments in relation to the replacement of this bridge. Following an attempt in 2001 by the Rail Infrastructure Corporation to place a load limit on the bridge, agreement was reached to jointly fund replacement of the bridge on a new alignment when the condition of the bridge reached a point where it could not maintain T44 loads with normal maintenance. 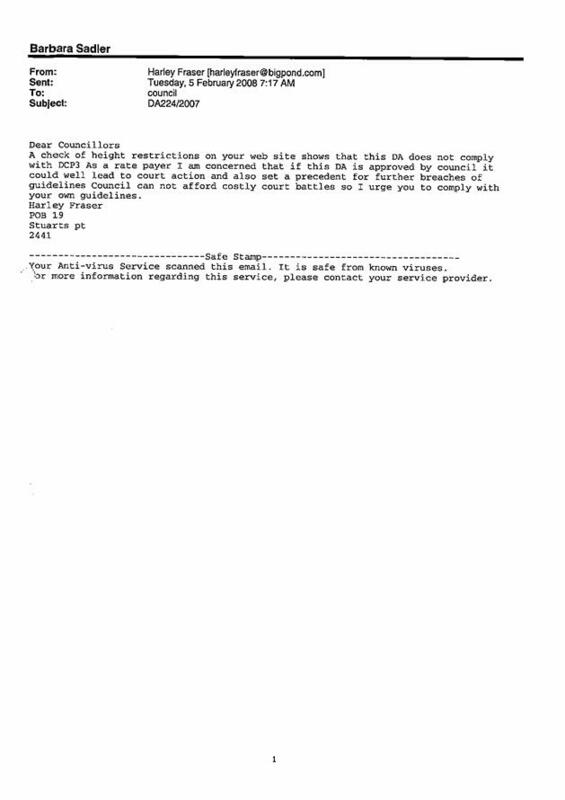 This was advised in a letter from RIC dated 28 May 2002, but RIC acknowledged that the operational needs of the bridge may accelerate the need for replacement but that it may not be in a position to fund its contribution before 2006. 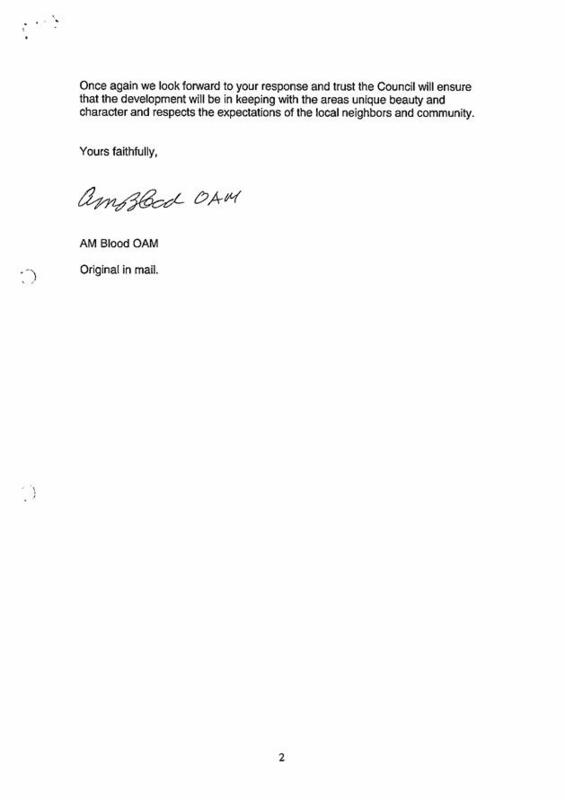 By letter dated 3 March 2003, RIC referred to the previous agreement and advised that, “the jointly funded replacement proposal is included in our Asset Management Plan for 2008/2009 and will be reviewed on an annual basis until then”. Given the agreement for a jointly funded replacement bridge, Council developed a Section 94 (developer) Contributions Plan which will have an estimated balance of $95,000 as at 30/6/2008. Council’s expectation has been that RIC would provide a 60% contribution to the work based on the fact that Council would be seeking to provide a higher service standard in terms of width and approaches to the bridge than currently exists. Whilst the replacement of the bridge has been an issue since 2001, with the lodgement of a development application for the Abigroup pre-cast concrete yard it has become more urgent. The Abigroup factory will involve the regular movement of concrete beams and pylons which together with the prime mover and trailer weigh more than the 62.5 tonne limit for B Doubles provided under the T44 load limit. Such loads can only be shifted across the bridge with a special permit which may or may not be granted. · Council takes on all future maintenance liability for the new overbridge. Council has made representations to the State and Federal Governments in relation to what can only be described as deliberate cost shifting. Disappointingly there has been no response from either the Rail Infrastructure Corporation or the Department of Transport. The NSW Department of State and Regional Development has been the only agency to respond to Council’s representations and are currently considering the provision of financial assistance to Abigroup as well as arranging discussions between their Minister, the Hon. Tony Kelly and the Minister for Transport and Deputy Premier, the Hon. John Watkins. It is hoped that RIC may reconsider their offer and provide additional funding over a number of financial years. Abigroup have now supplied a financial offer to assist in constructing the railway overbridge which is attached to the development application elsewhere reported in this business paper. The expectation of finance to be provided via the Department of State and Regional Development is at least $100,000. Considering the offer from Abigroup, the economic imperative of replacing the bridge and the fact that Council was always expected to make a significant contribution to the bridge replacement, it is recommended that Council proceed with an open tender for the design and construction of a replacement bridge and associated road works. A concept design for the bridge has been prepared by Abigroup which will be made available with the tender documents. There has been consultation with the Department of State and Regional Development, Abigroup, Council’s Section 94 Planner, Manager Financial Services, Director Engineering Services, Director Environment and Planning, Manager Planning and Assessment, and Senior Town Planner. Environment—There are no significant implications for the environment. The proposed replacement bridge will be located immediately to the north of the existing bridge. The provision of an asphaltic concrete deck should mean that less noise. Social—The bridge replacement itself has no significant social implications. Economic—The bridge replacement will remove a significant constraint on the development of the Macksville industrial area. It will also facilitate the establishment of the Abigroup pre-cast concrete manufacturing facility with a direct employment of 50 persons. There have also been very strong enquiries from other businesses wishing to establish in the industrial estate on the basis of the Abigroup development. Risk—The achievement of Abigroup’s stated direct employment of 50 persons is one risk which has been previously discussed. The Mayor, General Manager and Manager Business Development have put the importance of achieving this employment to Abigroup management directly. Abigroup management have confirmed both verbally and in writing that this employment level is a reasonable expectation based on their existing pre-cast concrete manufacturing plants in Wodonga and Brisbane. The Manager Business Development is visiting the Wodonga plant on Friday 28 February 2008 as part of annual leave to seek first hand confirmation. There is nothing further which can be done to manage this risk. Ultimately it needs to be understood that the attraction of new industries is very competitive and the successful Council will, like the successful company, undertake careful due diligence but still have to make an entrepreneurial business decision. There are risks associated with the tender price being higher than anticipated and with the forecast revenue from Section 94 contributions to pay for the loan being lower than anticipated. The risk in relation to the tender price could be reduced, but not eliminated, by an expensive and lengthy costing process using a quantity surveyor and other experts. Given the costing in this report is based on a concept design, this additional cost and delay is not considered to be warranted. There is a definite risk that the anticipated contributions from the Section 94 plan for the Upper Warrell Creek Railway Overbridge will be unable to finance the proposed loan repayments. The income for the Section 94 plan has been $8,000 for the past 12 months whereas the loan repayments are estimated to be $38,000 per year. This leaves a shortfall of $30,000 per annum which would need to be funded from General Fund. There is a possibility than some of this funding requirement may be recouped should the Section 94 contribution plan be reviewed, or the RIC improve their offer. · Direct and indirect impact on current and future budgets—The financial implications are discussed above. Based on the available information and a continuation of returns from existing Section 94 plans, the shortfall on the loan for the bridge would be $30,000 per annum. There is also an opportunity cost in the use of Section 94 road funds as those funds will not be available for other projects. One example is an outstanding action regarding the possible use of Section 94 funds to seal Irvines Road which is to be reported with the 2008/2009 budget. · Source of fund and any variance to working funds—The source of funds is detailed in the report. The NSW Food Amendment Act 2007 passed through the State Parliament on 1 No date of 1 July 2008. The Food Authority is now requesting those Council's who have not already done so to nominate the Category that best suits the role they play in the Food Regulation process. There are three (3) levels of food regulatory work that Council can undertake, being Category A, B, or C.
Category B best reflects the current level of Council's involvement within the Food Regulation program which has been traditional in Local Government prior to the activities being assumed by the NSW Food Authority. The new partnership agreement will see a much more formal structure between the NSW Food Authority, Local Government Authorities and Industry with guidelines on roles, setting of fees and charges and providing support and training. 1 That Council nominate to be in Category B under the new Food Regulation Partnership with the NSW Food Authority. 2 The fees and charges applicable to food businesses regulation and education be considered as part of Council’s normal budget process, commencing in February 2008. There are three options available to Council when looking at the new partnership proposal. 1 Nominate to go into Category A which would only involve Council in Emergency response work. 2 Nominate to go into Category B with Council being involved in Emergency responses, carry out routine food premises inspections, investigate food complaints, issue warnings, serve Improvement Notices and Prohibition Orders and take court actions where justified. 3 Nominate to go into Category C which includes all functions of category A & B and inspection roles of manufacturing or whole sale businesses. This level of commitment will require a further “Service Level Agreement” between Council and the Food Authority. The majority of Local Government Authorities are expected to nominate in category B as this best reflects Council’s traditional role in Food regulation and education. Council’s Environmental Health Officers undertake a dual role as Health & Building Surveyors, with current routine food inspections being undertaken on all premises annually by a contractor over two separate periods each year. Staff inspect premises in response to complaints, handle inquiries relating to food safety standards, food premises construction and upgrades required following the routine inspections by the contractor. Limited education is provided when dealing with customers as part of the food premises inspection program and when assessing development applications and applications for major events program being held on Council’s land. Council has not been involved in food education in the past and with the new partnership agreement it is planned to look at some form of basic food handling education for the local industry. Information is being surveyed as part of the current round of inspections as to the level of interest for such a program. Council may also from time to time become involved in investigation of food borne illness and follow up inspection of premises and in some emergency circumstance inspections for food recalls. Staff handle counter enquiries relating to Food handling, storage and construction standards for premises and mobile food vendors. There will be mandatory reporting periods on food borne illness and any Notices and court action that Council's may initiate with the first report period being 1/07 – 31/12/2008. The Partnership program commenced in October 2004 with the NSW Food Regulation Partnership – "Issues and Options" paper being released for Councils comment. 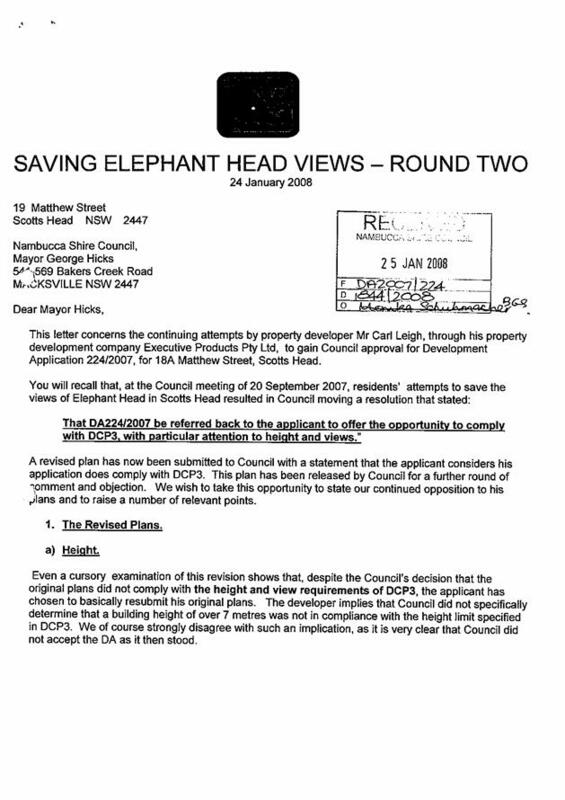 Council considered a report in relation to the original options paper on the 16 December 2004 and submitted a response. Staff attended further meetings and workshops over the next twelve (12) months in relation to the draft partnership proposals. The Food Authority has continued to establish the support network and undertake training of Local Government Environmental Health Officers through a series of quarterly meetings of the established Regional Food Groups throughout the State which meet every four (4) months. around the state at no additional cost to Council. The partnership program will have no direct impact on the environment. The impacts on the community will with good construction standards, handling practices and education will improve best practices and lesson impacts of food borne illnesses within the community. The objective of the program is to provide better outcomes and less impact on businesses through lose of business associated with poor food handling practices and loss of work time due to food borne illnesses in the general community. Council's traditional role in the Food surveillance and education area is basically the same under category B. The level of risk is similar and with additional support and training provided through the partnership program it is expected there is less professional liability risk. The draft fees and charges for 2008/09 have been changed to reflect Council's administration costs and contractors rates within the management plan. An additional registration fee structure is being proposed to off set Council's administration costs and provide for an annual food education program each year. The list of development applications received by Council from 11-22 February 2008 is listed for Council’s information. 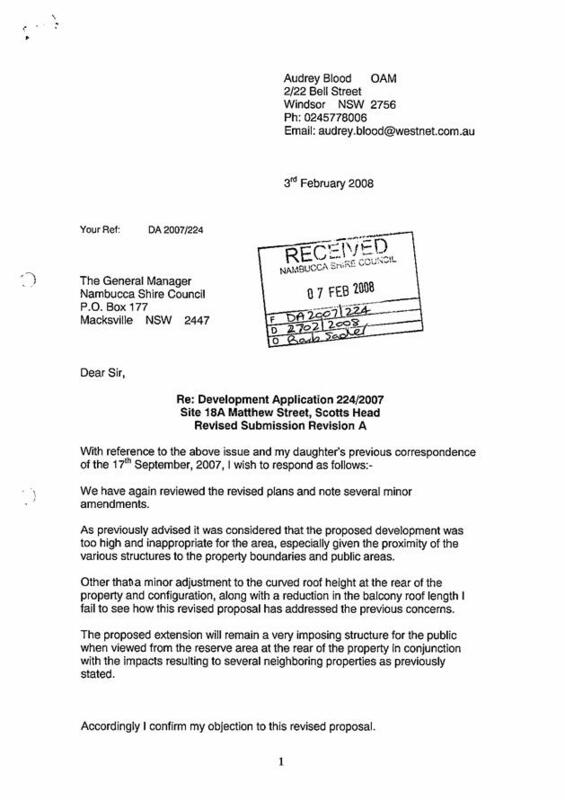 That the list of development applications received 11-22 February 2008, be noted and received for information by Council. 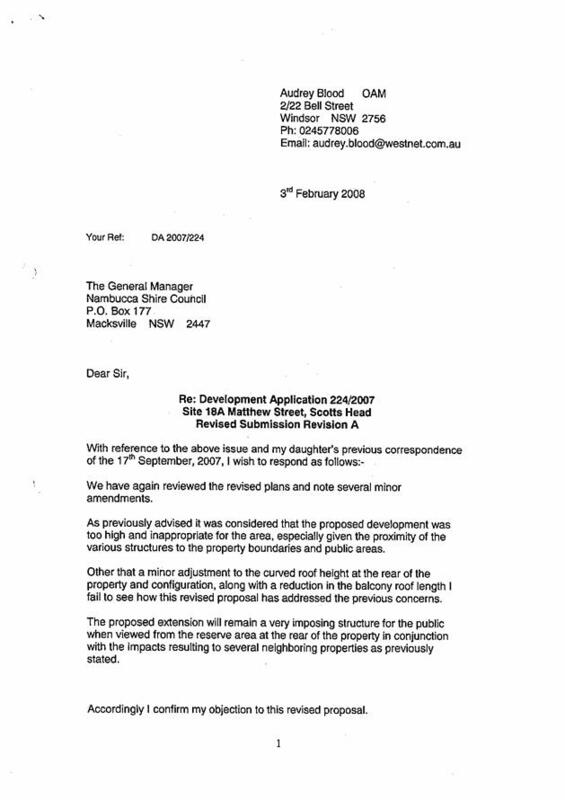 Development consent was issued for development application 2006/083 on 2 March 2006 for the operation of a Home Activity (Bus Garage) at 53 Borefield Road, Bowraville. The consent included a condition which imposed a two (2) year time limit on the operation of the activity. 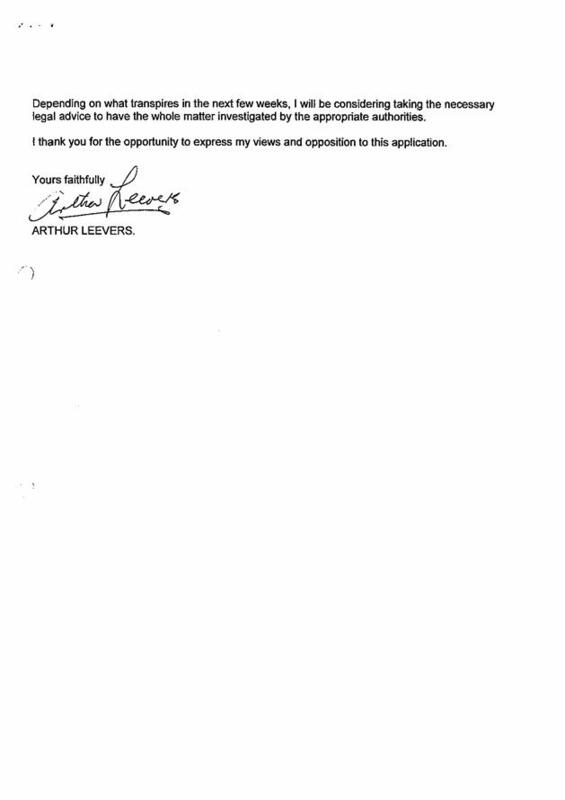 In accordance with condition 2, if the applicant wishes to continue with the activity, he is required to lodge an application to amend the condition of consent relating to the time limit, providing this is determined prior to the consent lapsing (13 March 2008), and providing the activity has continued to operate in accordance with the conditions of the development consent. Having regard to the above, the applicant lodged an application under s96 of the EP&A Act to modify the terms of the development consent. The applicant has demonstrated compliance with all conditions of consent except Condition 11 (road sealing) since development approval was granted. Provided the activity continues to be conducted in accordance with all the other conditions of consent, it is not considered that the continuation of the activity will significantly impact upon the existing amenity of the area. 2 Development consent is valid for 2 years from date of issue. Prior to the time limit on the consent lapsing, a new development application will be required to be determined by Council if the applicant wishes to continue the activity. Alternatively, Council may be approached to amend the condition of consent relating to the time limit, providing this is determined prior to the consent lapsing, and providing the activity has continued to operate in accordance with the conditions of development consent. 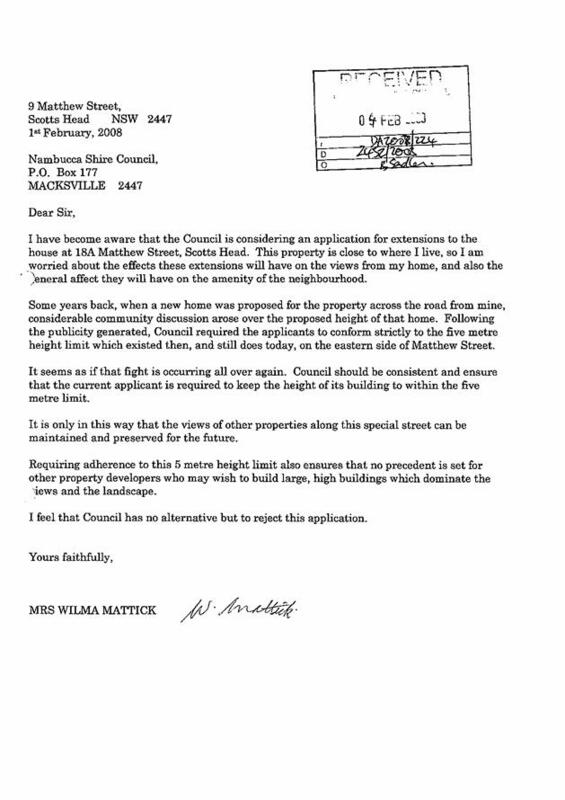 b That the adjoining owner (Mr Lennon) be advised that condition 11 (road sealing) will be removed from the development consent if he does not provide, within 3 months, written advice allowing access to his property to enable the applicant to comply with condition 11 of the development consent. c That those persons who made submissions in respect of the proposal be advised of Council's decision. Council may choose to not delete condition 2, and therefore the consent would lapse. However, if this course of action is adopted, Council will need to provide valid reasons for not amending the development consent. The proposed amendment involves the removal of condition 2 of the development consent which relates to the time limit on the activity. This condition provided a mechanism for Council to undertake regular monitoring of the activity during the first two years of operation, and restrict the activity until such time as compliance with all conditions of development consent was demonstrated. In accordance with Council’s adopted practice, the modification application was notified to eight (8) adjoining owners for a period of 14 days (excluding public holidays and Council’s closure over the Christmas and New Year period). 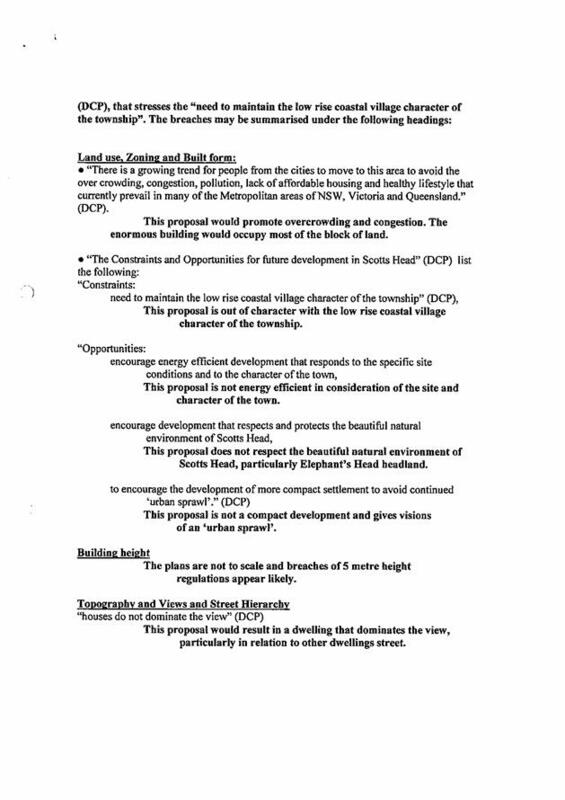 The proposal was available for viewing at Council’s Administration Centre during the notification period and submissions accepted up to and including 18 January 2008. Council received two (2) written submissions from adjoining landowners objecting to the proposal, copies of which are attached for Council’s information. The submissions express concern that the home activity interferes with the rural amenity of adjoining residents, particularly in relation to dust, noise, fumes and increased traffic. These concerns are the same as those raised in response to the original development application lodged in November 2005. The submissions were duly considered during that assessment process and appropriate conditions were included in the consent to mitigate potential impacts and address the specific concerns raised by the adjoining residents. The submissions also raise concerns that the removal of the time limit on the activity will effectively remove the applicant’s obligation to comply with the conditions of consent and remove the requirement for Council to undertake regular compliance monitoring of the activity. Compliance monitoring to date has shown that, with exception of condition 11, the activity complies with the conditions of development consent. However, should there be any breach of the development consent conditions, Council would be obliged to take appropriate action in accordance with the relevant provisions of the EP&A Act. This applies to any development consent approval. · The modification is of minor environmental impact. · The development as modified is substantially the same development as approved. · The application has been notified in accordance with a DCP for notification and advertising. · Any submissions concerning the modification have been considered. · Council has considered any relevant matters under Section 79C(1). The requirement for bitumen sealing of the right-of-carriageway was intended to reduce dust in proximity of the adjoining neighbour’s dwelling. This condition has not been complied with (see further comments below). A concrete bund has been constructed around the above ground fuel tank in accordance with Condition 9 of the development consent. The bund complies with the relevant Australian standards. The bund is designed to contain fuels and thereby minimise risk to the water quality of the surrounding catchment and borefields. Notwithstanding condition 11, provided the activity continues to operate in accordance with all the other conditions of development consent, it is not anticipated that any significant environmental impacts will resulting from the removal of the time limit on the activity. The proposal is considered to be substantially the same development as approved, ie operation of a bus garage as a home activity. Regular monitoring and inspection of the activity by Council officers has been undertaken since development consent was granted and, despite numerous allegations from the adjoining land owner, the activity has demonstrated compliance with all conditions of consent except for Condition 11. Condition 11 requires the bitumen sealing of the right-of-carriageway adjacent to the dwelling on the adjoining property, Lot 461 DP 710439. This condition has not been complied with because the owner of the adjoining property (Mr Lennon) is not prepared to facilitate the sealing of the carriageway by the applicant. 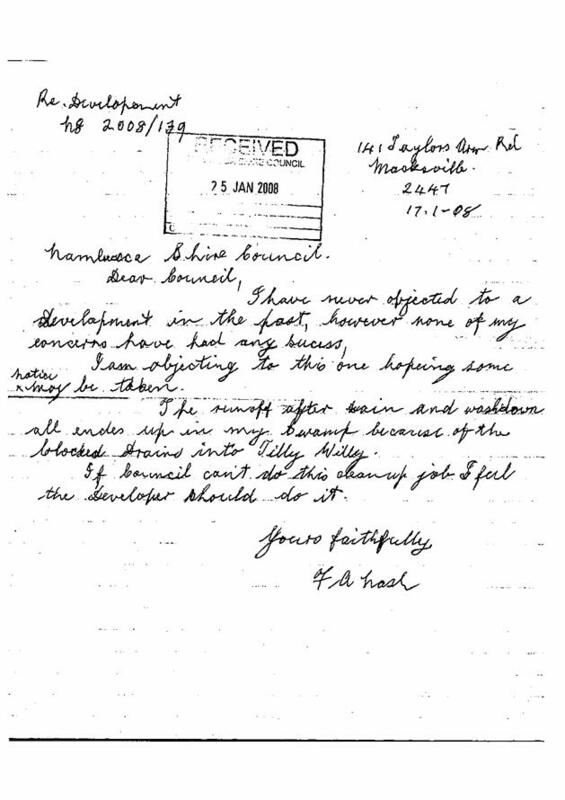 Council has a letter from the applicant, dated 29 June 2006, outlining his compliance with the conditions of consent and his attempts to comply with condition 11. The letter from the applicant is marked ‘private and confidential’. 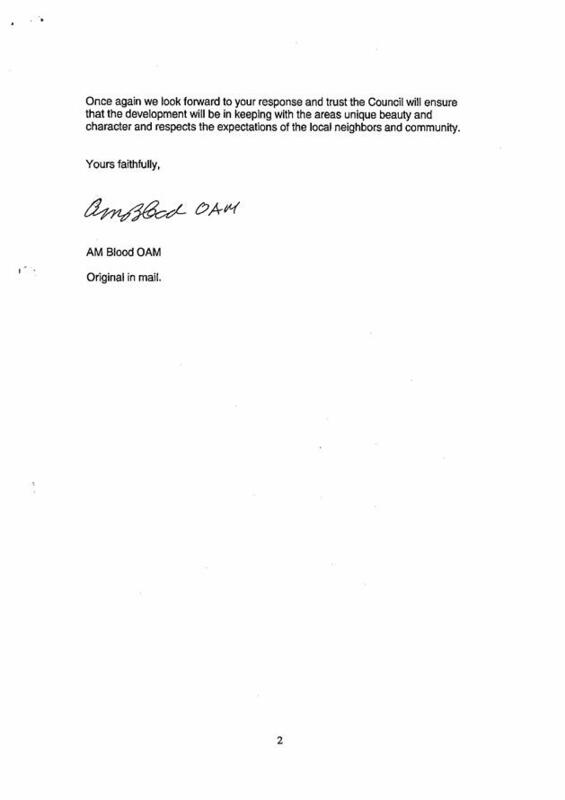 A copy of this letter is not attached to this report, however, it s available for any Councillor to view. Suffice to say that it appears the applicant has made every reasonable attempt to bitumen seal the right-of-carriageway in accordance with condition 11. Having regard to the above, it is considered that the adjoining owner should be advised that unless he prepared to provide written consent to facilitating the sealing of the right-of carriage-way within three months of the determination of this application, Condition 11 will cease to be a condition of consent. The imposition of a two (2) year time limit on the consent and the requirement for a site inspection after six (6) months of operation, was implemented as an effective means of monitoring the likely impacts of the home activity and ensuring the activity is undertaken in a manner that minimises adverse impacts on the environment and the amenity of the surrounding residents. It is considered that the limited consent has served its purpose. 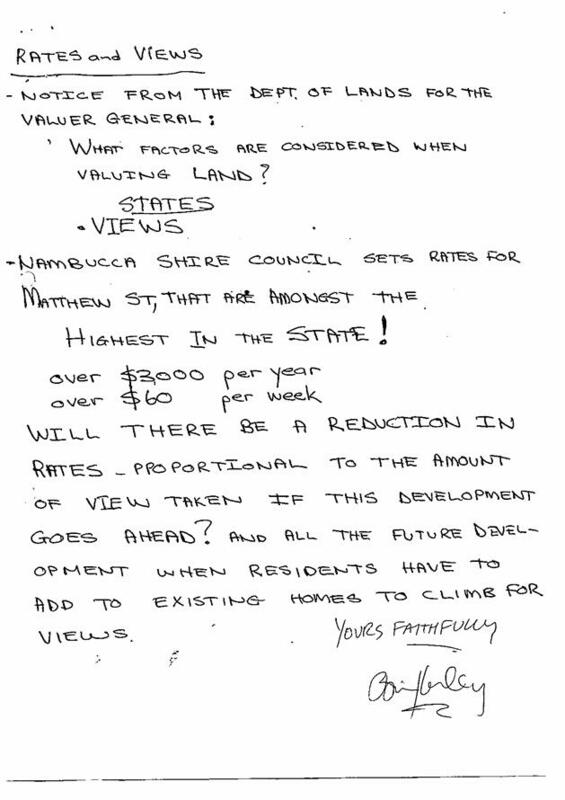 The activity complies with the definition of a Home Activity under the Nambucca Local Environmental Plan, and is considered a permissible land use in this location. No objections raised to the modification application. Appropriate conditions have been included in to the development consent to limit any significant environmental impacts. The local bus service provides a social benefit for the district. The activity provides economic and employment opportunities for the residents/operators of the bus operation. There is a risk that if Council decided to refuse the application to modify the consent it will lose a local service to the community, and risk an appeal by the applicant to the Land and Environment Court. If an appeal is lodged, it would have financial implications for Council. The development application is for additions to a 2 storey brick and tile dwelling house on land identified by Councils DCP 3 height maps as having a 5 metre height limit. On the basis of the original plans, a report recommending approval was considered by Council on 20 September 2007. 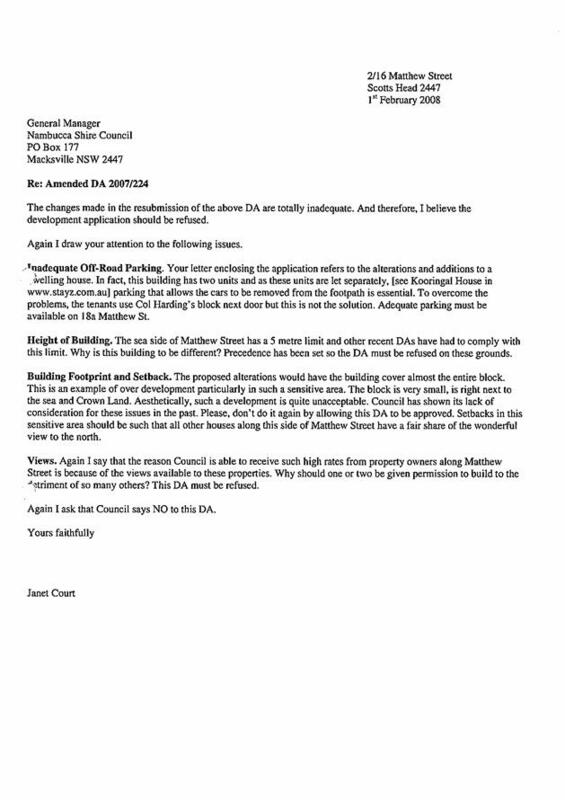 At this meeting Council made no determination of the application but instead resolved that it be referred back to the applicant “to afford the opportunity to comply with DCP 3 with particular attention to height and views”. A further resolution was made in relation to adopting an interim minimum building line setback to the adjoining public foreshore reserve of 4m with this matter being referred to Council’s Reference Group for discussion and consideration. 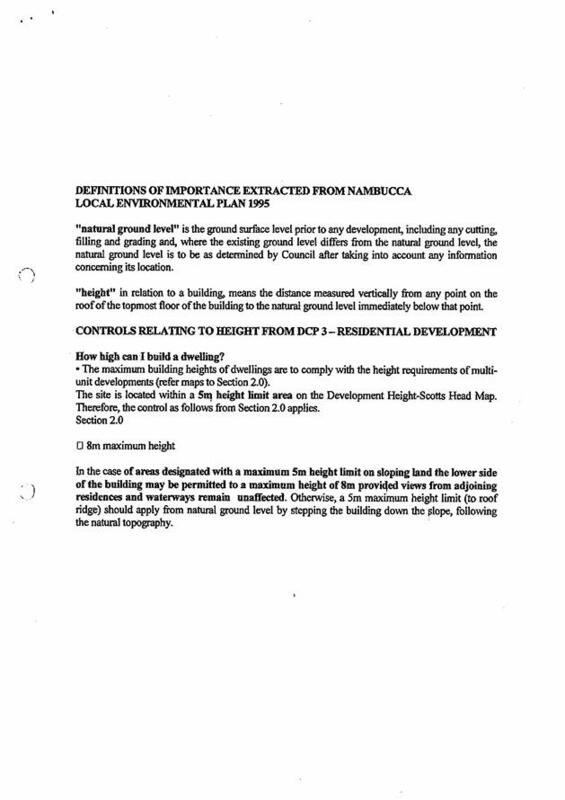 On 16 October 2007 the applicant submitted amended plans to Council that made several minor changes to the original proposal, including a minor reduction in the maximum height of the building to 6.8 metres above natural ground level. 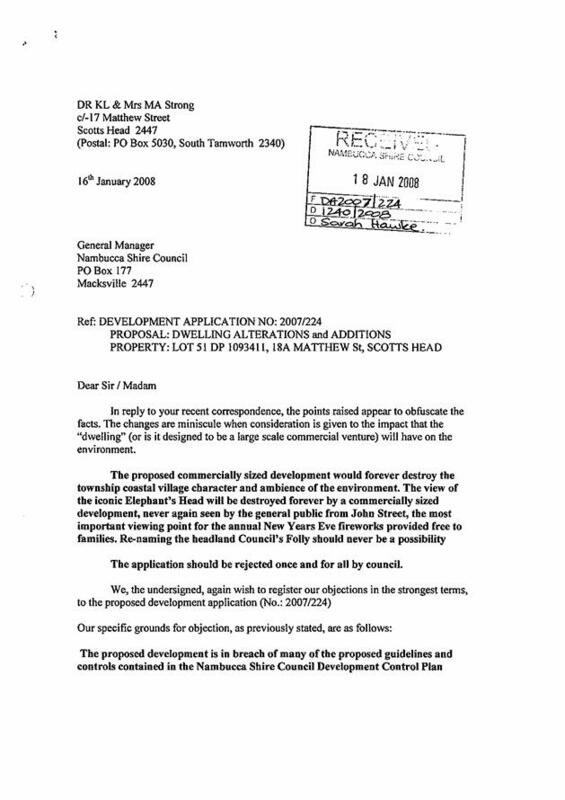 The amended plans were re-notified for a period of 14 days beginning on 11 January 2008 and 20 submissions were received by Council objecting the proposal. It is apparent that there continues to be divergent opinions regarding the interpretation of the 5 metre height limit and the degree to which the proposal complies or does not comply with DCP 3. It is the opinion of Council’s Planning Department that the proposal generally complies with the DCP, notwithstanding that the building additions exceed 5 metres and that views from adjoining residences will be affected. It is considered that a literal interpretation of the DCP which arguably states that the proposal is unacceptable solely on the basis that views are affected, would be unreasonable and incorrect. Rather, the issue of views being affected by the development deserves critical assessment and the relative impacts of the development needs to be weighed up as part of a proper assessment of the proposal under S79C of the EP&A Act 1979. A thorough assessment of the amended proposal has been undertaken by Council’s Planning Department in accordance with Section 79C and the application is again reported to Council with a recommendation for approval. 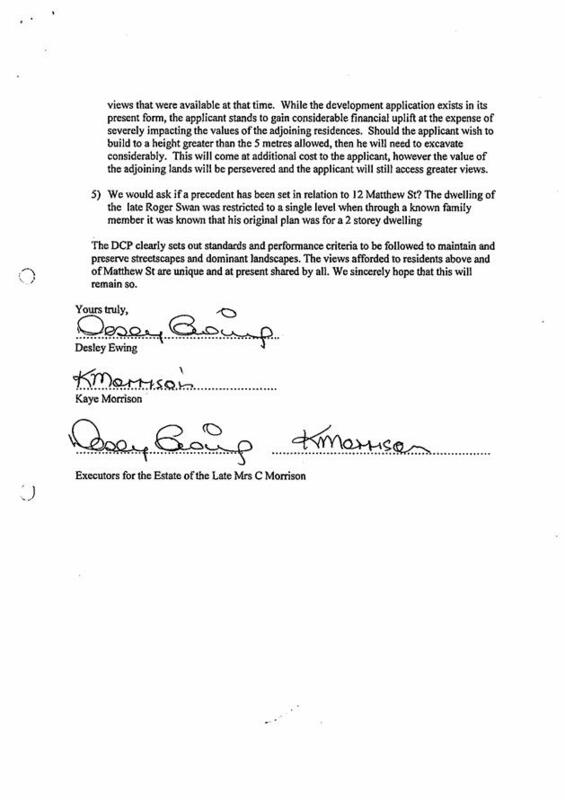 Council has previously given the applicant an opportunity to amend the proposal to comply with DCP 3. Although the applicant believes that the original proposal complies with the DCP, several amendments were made to the original proposal in an attempt to make it more acceptable to Council. However, the applicant has advised that he is not prepared to make any further amendments to the proposal and is seeking Council’s determination of the application. · Approve the development application in accordance with the recommendations, on the basis that the proposal generally complies with DCP 3, noting that the degree to which views are affected has been critically assessed in accordance with best practice principles and is considered acceptable. · Refuse the development application, on the basis that the proposal does not comply with DCP 3, specifically with regard to height and views. 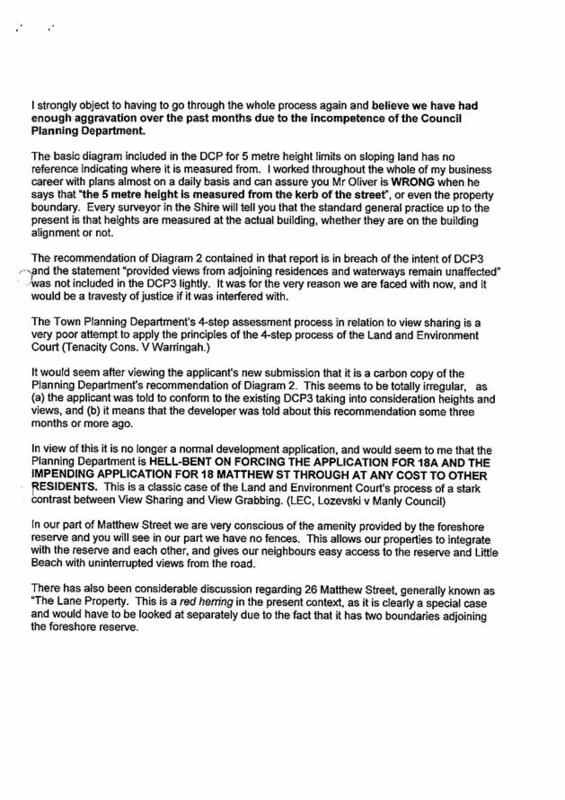 · Defer making a determination on the application, pending a place based management plan for the locality in accordance with the Reference Group’s resolutions for future redevelopment of the Matthew Street precinct. However, caution should be exercised in regard to this option, as it is highlighted that Council has a responsibility to determine a development application following a proper assessment of the merits of the proposal and its relative compliance with Council’s adopted environmental planning instruments. 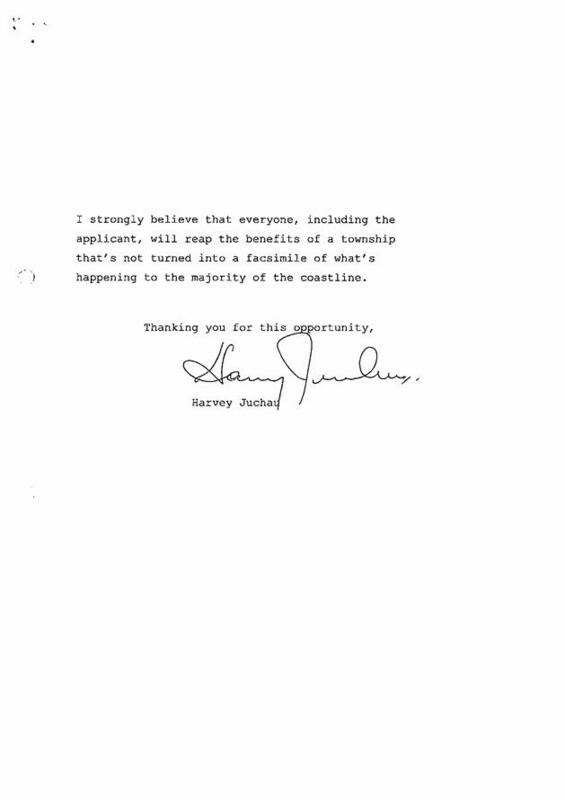 It is reasonable for applicants to expect that their application is not deferred indefinitely, on the basis that Council is not prepared to make a determination. 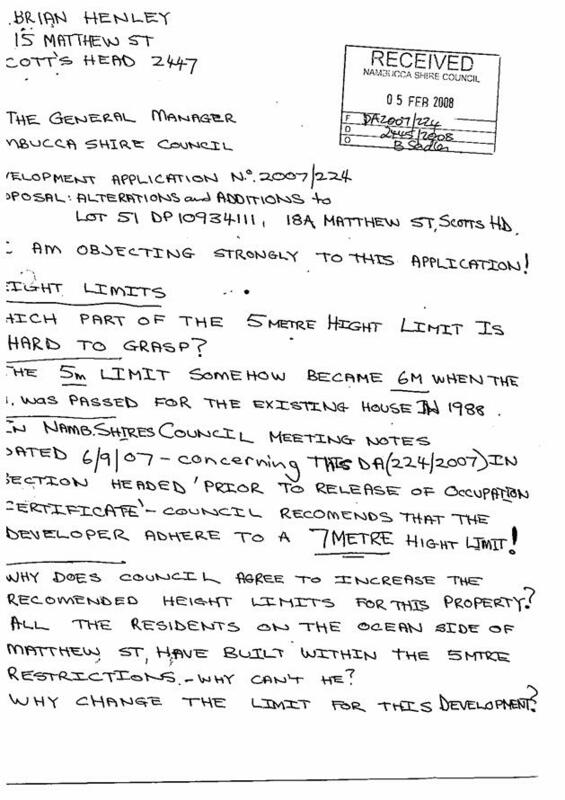 Discussions with the applicant indicate that if it is Council’s opinion that the proposal does not comply with the height provisions of DCP 3, then this application should be treated as a request to vary the standard and dealt with on its merits considering the other buildings in the vicinity. The amended proposal is essentially the same development that was reported to Council previously, with several amendments to address some of the concerns raised with the initial design. 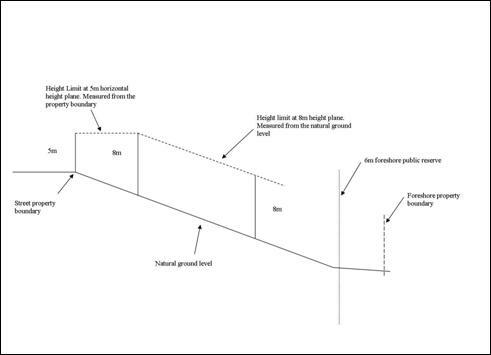 · The proposed roof over the east facing balcony has been reduced in length from 4.5m to 1.0m. · The existing tiled roof is to be replaced by a metal roof to match the new additions. · The new curved roof has been adjusted and the maximum height of the building is 6.8m above natural ground level. 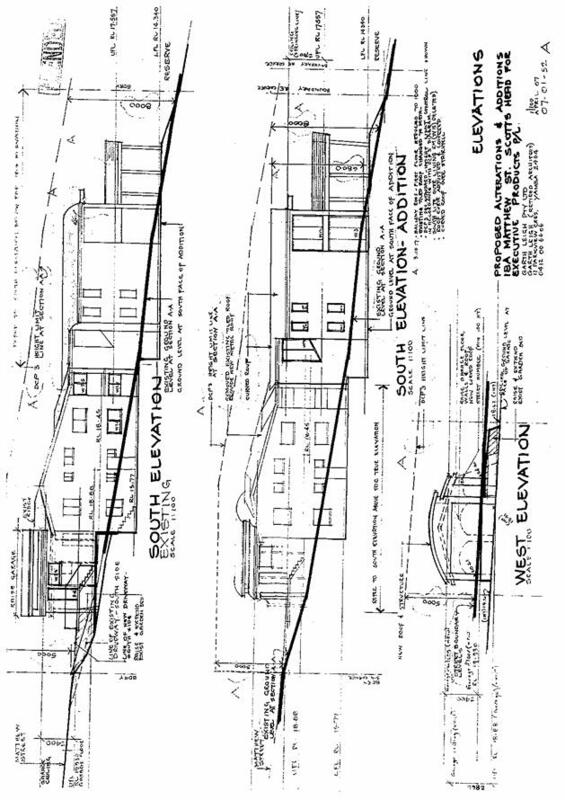 · The splay to the north east corner of the proposed addition has been reduced and adjusted to run parallel to the northern boundary. Each of the proposed amendments has been offered by the applicant in an attempt to make the proposal more acceptable to Council, notwithstanding that the applicant believes that the original proposal was compliant with the DCP. The amendments will reduce the impacts of the development on adjoining landowners and improve opportunities for view sharing being the main concern for objection. The application has been considered by Council’s Operations and Technical Services and Health and Building Departments who raised no issues or expressed any concerns with the proposal that would preclude approval of the application. 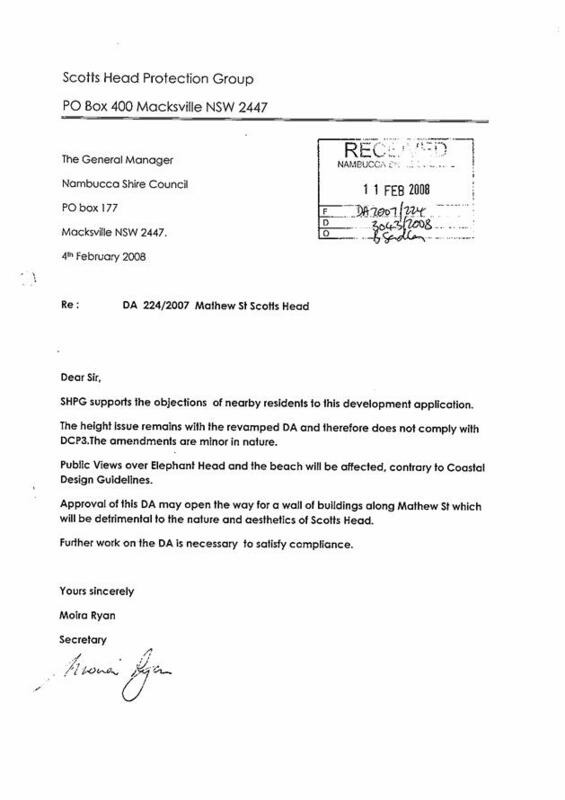 The application was referred to the Department of Planning under SEPP 71 – Coastal Protection, however the Department declined to comment on the matter apart from advising Council that amendments to the policy had removed the need for referral of this type of development under Clause 11(2). The application has been notified to adjoining landowners on 2 separate occasions. The initial development plans attracted a total of seven (7) submissions received objecting to the proposal. The re-notification of the amended plans attracted 20 submissions received objecting to the proposal. The objections generally argue that the application does not comply with Council’s DCP for residential development as it, exceeds the 5 metre height limit, affects views, is an overdevelopment of the site and will set a precedent for future development. Planning Consultants were engaged by the applicant and one of the objectors, to assist in arguing their respective cases and a legal opinion was submitted to Council on behalf of one of the objectors. Council sought its own legal advice regarding the matter which has been disclosed to Councillors but is privileged information and will not be publicly disclosed. The legal advice acknowledged the anomalies and inconsistencies in the DCP and to the LEP and the potential for various interpretations of the height limit which applies to the site. However the advice did stress that the weight afforded to the DCP provisions is a matter for the Council in its assessment of the application. Council was also advised that to protect itself from criticism, it needs to ensure that the amended application has received a proper assessment under Section 79C of the EP&A Act 1979. Council also sought the input of the Reference Group to assist in the assessment of the application by seeking clarification on the interpretation of the 5 metre height limit and the recommendation for a 6m building line setback to the foreshore public reserve. 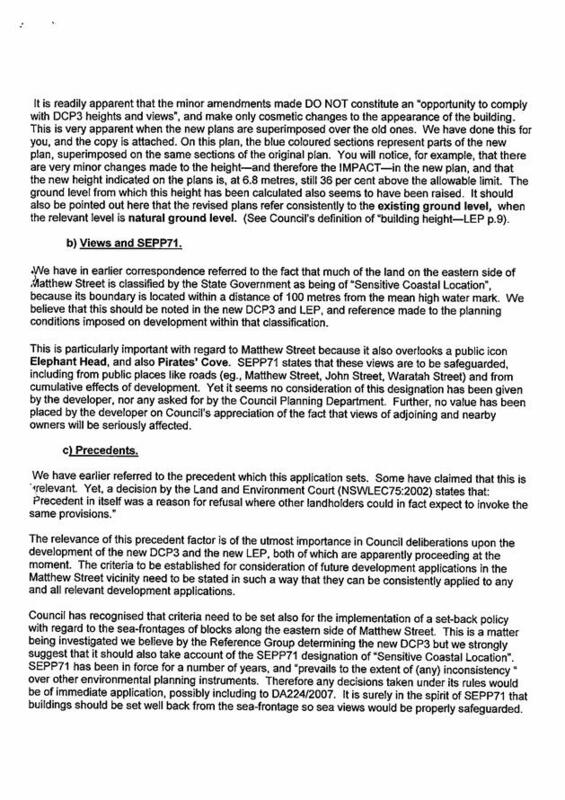 In relation to these issues the Reference Group resolved to investigate opportunities for an urban design strategy looking specifically at Matthew Street and other areas with similar constraints. No further progress has been made with regard to these resolutions. The land is zoned Residential 2(a) (Low –Medium Density). The proposal for dwelling house additions is permissible within the zone. Council’s Local Environmental Plan stipulates that the maximum height of buildings in the 2(a) zone is to be restricted to 8 metres, however the site is within the area designated with a maximum height of 5m in accordance with Council’s Height Maps contained within the DCP for Residential Development. The original impetus for the 5m height limit was to allow for a degree of view sharing between residences, particularly those residences on the western side of Matthew Street which overlook the properties nominated with the 5m height limit. The proposed development exceeds 5m to a maximum ridge height of approximately 6.8m. It is important to note that buildings within the area designated with a maximum height of 5 metres can exceed the height limit in certain instances, to a maximum height of 8 metres. Indeed many of the existing dwelling-houses within the area designated with a maximum height of 5 metres (including the subject site) are currently 2 storey construction and already exceed the 5 metre height limit. It is the opinion of the Planning Department that it is reasonable to expect that properties in Matthew Street with the potential for redevelopment, are able to accommodate an appropriately designed 2 storey dwelling house. It is unrealistic to expect that a 2 storey dwelling can be constructed within a 5 metre height limitation without substantial cut and fill. However, an eight metre height limit provides reasonable scope within an appropriate building envelope for construction a of a 2 storey dwelling house. There are no relevant provisions of the Regional Environmental Plan that specifically apply to the proposed development. No draft environmental planning instruments currently apply to the land or the proposed development. However, it is worth noting that Council is currently reviewing DCP 3 with a view to preparing a draft DCP for Residential Development. The new DCP will resolve the inconsistencies and anomalies within the current document and address many of the concerns which have been expressed in the submissions. The Draft DCP is being prepared in accordance with the review undertaken by Sutherland Koshy and as a result of ongoing consultation with the Reference Group. 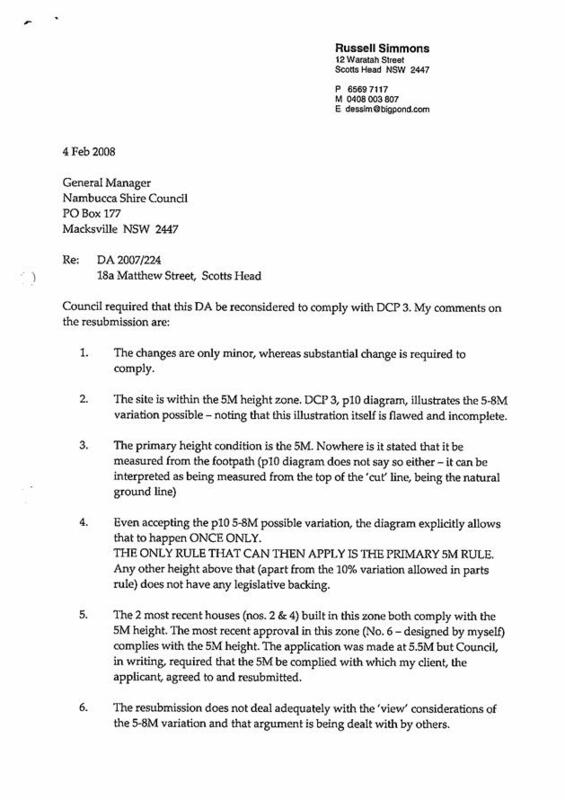 Most recently the Reference Group considered the issue of the 5m height limit, with a view to clarifying the interpretation of the height limit and considering the recommendation for a 6m building line setback to foreshore reserve areas. As stated the reference Group have recommended that an urban design strategy be undertaken which will address the issues of height and setbacks to the reserve. 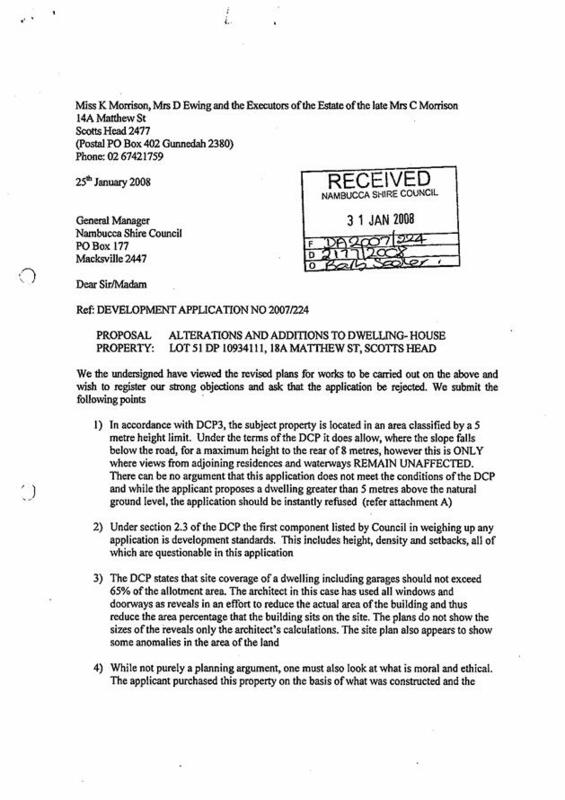 DCP 3 - Residential Development applies to the site. It is considered that the proposal satisfies the relevant aspects of the critical design elements as set out in the DCP. 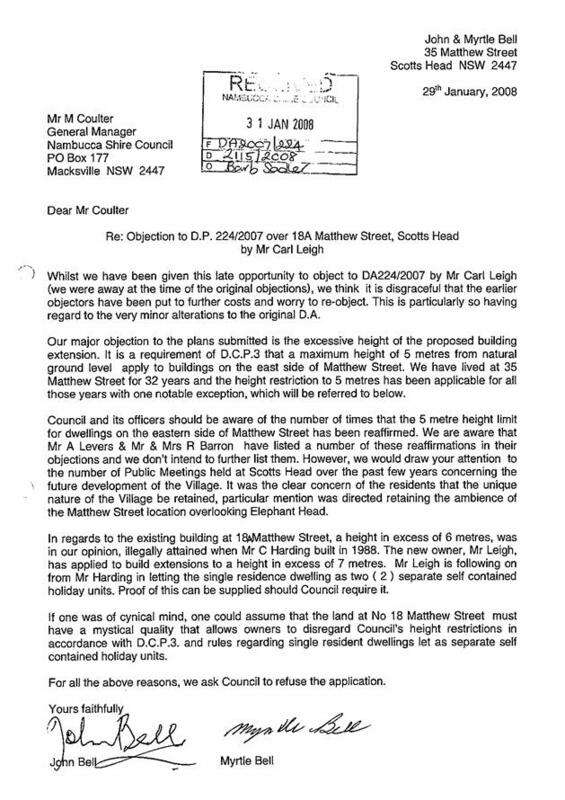 Many of the submissions received by Council expressed perceived deficiencies in the content and design parameters of the DCP and questioned the interpretation of the maximum height limit of 8 metres being allowable in an area designated for a 5 metre height limit. For this reason the issue of height and compliance with the critical design elements of the DCP has been addressed in detail in this report. “In the case of areas designated with a maximum 5m height limit on sloping land the lower side of the building may be permitted to a maximum height of 8m provided views from adjoining residences and water ways remain unaffected . Otherwise a 5m height limit (to roof ridge) should apply from natural ground level by stepping the building down the slope, following the natural topography”. 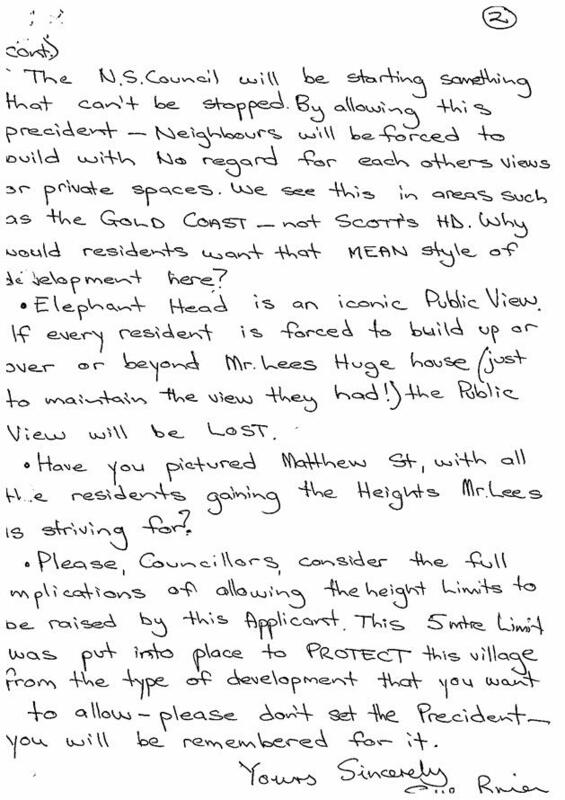 The critical issue in the assessment of this application is whether the proposed height of 6.8 metres is acceptable given that views from adjoining residences will be partially obstructed, even though it is acknowledged that the land is sloping and the lower side of the proposed addition does not exceed 8 metres. A basic diagram is included in the DCP to provide an interpretation of the height limit. 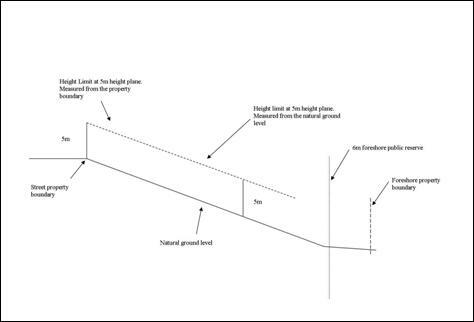 The diagram indicates that the 5m height limit is measured from the front property or street boundary, with the 8m height limit applying from existing natural ground level across the development site. It is important to note that buildings within the area designated with a maximum height of 5 metres can exceed the 5m height limit in certain circumstances. Indeed many of the existing dwelling houses within the area designated with a maximum height of 5 metre height limit are a mix of single and 2 storey dwellings which exceed the 5 metre limit. It is recognised that the diagram in the DCP is not detailed and there is therefore varying points of view concerning the proper interpretation and application of the 5m height limit. (a) Whether the 5m height limit should apply uniformly across the whole of the site measured from the natural ground level. If Council believes that Diagram 1 is the more accurate interpretation of the DCP, then the proposal does not comply. 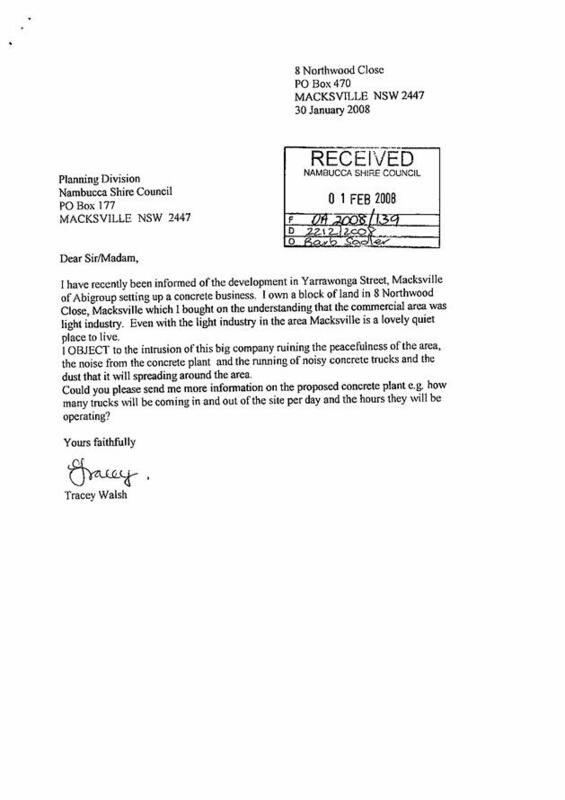 This effectively means that development within Mathews Street will be limited to single storey construction unless substantial excavation is proposed to embed any proposed development into the slope, thereby reducing the overall height of the building to comply with 5 metres (when measured from natural ground level, or ground level prior to excavation). The environmental impacts of substantial excavation in this locality would need to be carefully considered and may be undesirable, given that it is within a sensitive coastal location. (b) whether the 5m height limit should apply across the site until the 8m height limit is achieved, when measured from the natural ground level. It is clear from the DCP that in the case of areas designated with a 5m height limit on sloping land, Council has the ability to permit a maximum height of 8m on the lower side of the building. Notwithstanding the contentious issue of whether views remain unaffected, it is considered that Diagram 2 most accurately reflects the intent of the DCP. This means that a building within the area designated with a 5m height limit, on sloping land is not necessarily limited to an overall height of 5 metres, but must fit within a height plane as indicated above. If Council believes that Diagram 2 is a more accurate interpretation of the DCP, then the proposal complies (insofar as being within the height plane) and therefore, the issue of views being affected becomes the primary concern for Council’s consideration. 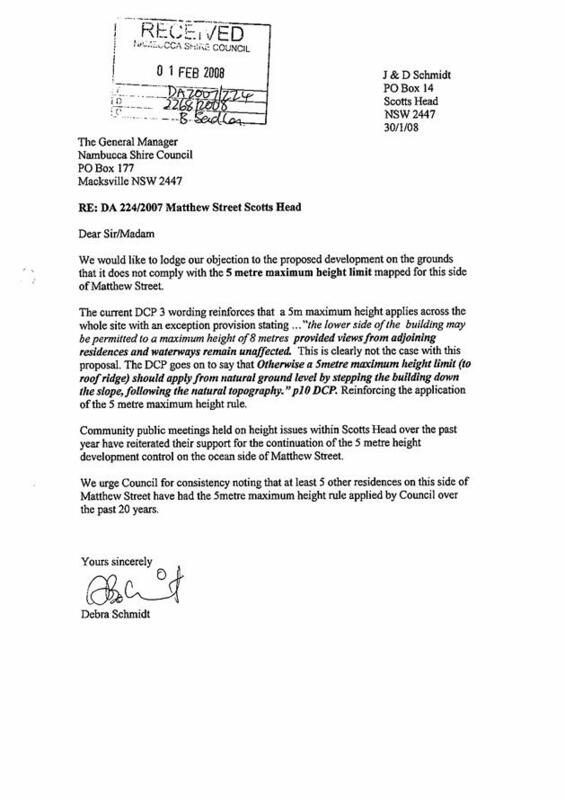 The critical issue for Council in its assessment of applications and balancing competing interests, is whether the height of a building over 5 metres but less than 8 metres is acceptable in instances where views from adjoining residences will be affected. · assessing the reasonableness of the proposal causing the impact. The four step assessment is in keeping with the best practice principles of the Land and Environment Court. Generally, it is considered acceptable for a building to affect views from an adjoining property, particularly when those views are achieved by overlooking a development site and where the proposed development satisfies the other objectives and performance criteria which form the basis of the height limit. Council is reminded that the above two scenarios where presented to the Reference Group where no recommendation was made as to which of the above two diagrams best address the height interpretation for the new DCP. 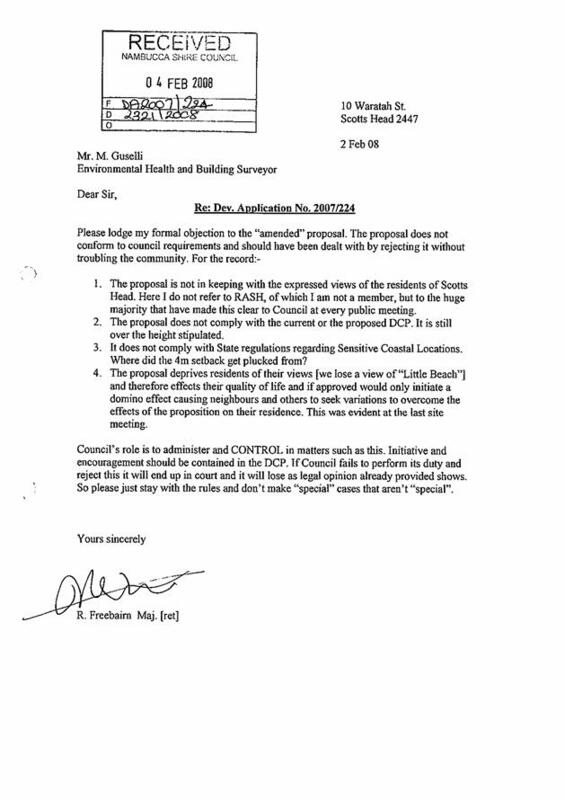 It is noted that the proposal was referred to Department of Planning who declined to make any comment other than advising Council that the proposal did not require referral under recent amendments to SEPP 71 – Coastal Protection. The proposal is within the coastal zone and within a sensitive coastal location and therefore requires consideration of the matter listed under clause 8 of SEPP 71, however the application is not significant coastal development for the purposes of the SEPP. Clause 8, Matters for Consideration under Part 2 of the SEPP are addressed below;. 8b – public access to and along the coastal foreshore for pedestrians or persons with a disability should be improved. Proposal does not impede on good pedestrian access to the coastal foreshore. 8d – the suitability of development given its type, location and design and its relationship with the surrounding area. Proposed addition is considered compatible in height and bulk with neighbouring dwellings. 8e – amenity of the coastal foreshore, overshadowing of the coastal foreshore and loss of views from a public place. There will be no overshadowing of the coastal foreshore. Minimal loss of views from adjoining or nearby residences over the development site. 8f – means to protect and improve scenic qualities. Height and views discussed separately in body of report. 8j – coastal processes and coastal hazards. The impact of coastal processes and hazards are not considered to be a threat to or by the proposed development. 8l – measures to protect Aboriginal heritage. No identified Aboriginal heritage issues with the site. 8m – impacts on water quality of coastal waterbodies. The proposal is unlikely to impact upon water quality of the coastal waterbodies. 8p(i) – the cumulative impacts of the proposed development. Redevelopment has begun and will continue along this section of Matthew Street. The proposal is considered to be in keeping with the existing redevelopment and expected future redevelopment of these sites and whilst adding to the cumulative effect it is not considered that the cumulative impact is unreasonably above what would be expected. 8p(ii) – measures to ensure that water and energy usage by the proposed development is efficient. The proposed addition is designed to take advantage of the east-north-east aspect resulting in efficient energy use and consumption. The remaining clauses of SEPP 71 relating to Clause 14 – Public Access; Clause 15 – Effluent Disposal; and Clause 16 – Stormwater, have been considered as being either addressed as the proposal does not impact upon public access, the lot is connected to Council’s reticulated sewerage system and stormwater disposal is manageable. The proposed development will have an impact on directly adjoining properties by contributing to overshadowing and partial obstruction of views to the ocean. However it is highlighted that the level of overshadowing is not excessive and complies in all respects with Council’s minimum requirements in the DCP. The issue of view loss is more complex in these circumstances and deserves a broader explanation. Generally speaking, Council does not object to a compliant development that contributes to an obstruction of views from an adjoining property when those views are achieved by overlooking a development site. Put simply, private landowners should not rely on an unobstructed view which is enjoyed over another property. However the 5 metre height limit is intended to allow a degree of view sharing between property owners, such that a development does not unreasonably obstruct the water views enjoyed by another property. The key issue with the development application, is whether the proposed height of the dwelling addition is acceptable, given that it exceeds the 5 metre height limit, but is less than 8 metres, and whether the contributory view loss is reasonable in the context of the views which will remain unaffected by the development. After careful consideration of the impacts, which have included site inspections from adjoining properties, it has been determined that the degree of view loss from adjoining properties is partial and limited to a single line of sight over the development site. Although views will be affected by the development, the adjoining properties will continue to maintain uninterrupted water views over and to the side of the development. Given that the proposed additions comply with Council’s DCP requirements, the degree of view loss is considered to be partial in the context of the whole of the view, and therefore reasonably expected. It also needs to be recognised that Matthew Street has a significant degree of redevelopment potential and it is likely that major additions to existing houses or new development will occur in the next few years to take advantage of the views and unique aspect of the locality. This redevelopment should ensure that each property has the ability to maximise their aspect and views when they choose to redevelop the site. The impacts of the development on the character of the area are difficult to quantify at this stage, given the eclectic mix of development styles and design characters of development in the locality. It is reasonable to expect that the locality will transform with redevelopment that aims to take advantage of the views and aspect of the area. This redevelopment potential will undoubtedly result in larger residential dwellings, incorporating extensive balconies and most likely include a progressive creeping forward of development towards the foreshore reserve. These are all issues that Council will need to be mindful of when preparing the new DCP, to ensure that a consistent application of development standards allows all properties to gain the same opportunities from redevelopment. The site is constrained by a moderate slope as well as an irregular shape. The 5 metre height limit also acts as a further development constraint. The foreshore reserve provides an effective buffer between private land and public space and any development should be sensitive to this by providing an appropriate setback. The development proposal is setback 4 metres from the foreshore reserve boundary. The application has been notified to adjoining landowners on 2 separate occasions. The initial development plans attracted a total of seven (7) submissions received objecting to the proposal. The notification of the amended plans attracted substantially more submissions received objecting to the proposal. This statement has been carefully considered and it is accepted that the development will partially affect the views from adjoining residences, because those views rely on a clear line of sight over the development site. The height of the 2 storey addition exceeds 5 metres but is within the 8 metre height limit allowable under NLEP 1995. It is the position of the Planning Department, that the proposal is consistent with the DCP’s diagrammatic representation of allowable heights in the 5 metre height limit. 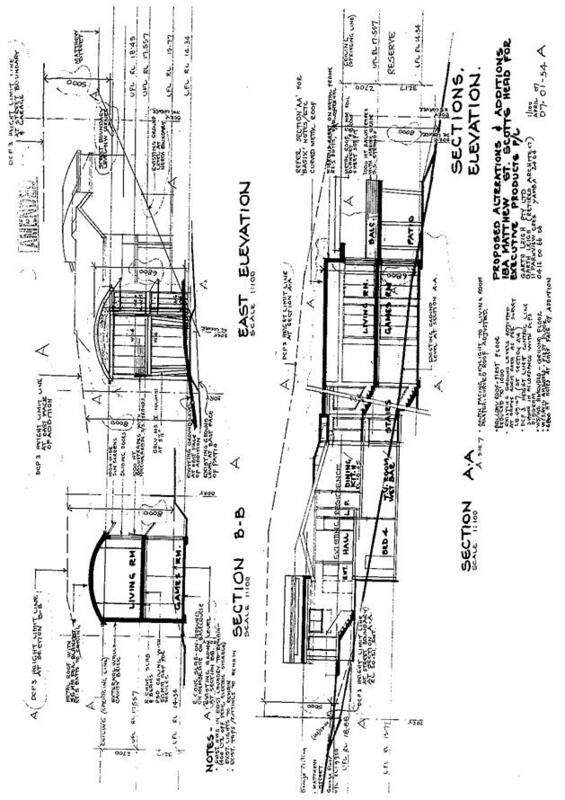 · Submissions were made in regard to the height of the proposed alterations to the garage at the front of the residence, which exceed the 5 metre height limit. The maximum height of the front section of the dwelling, allowing for an increase to the floor and roof height of the double garage will be approximately 6m. 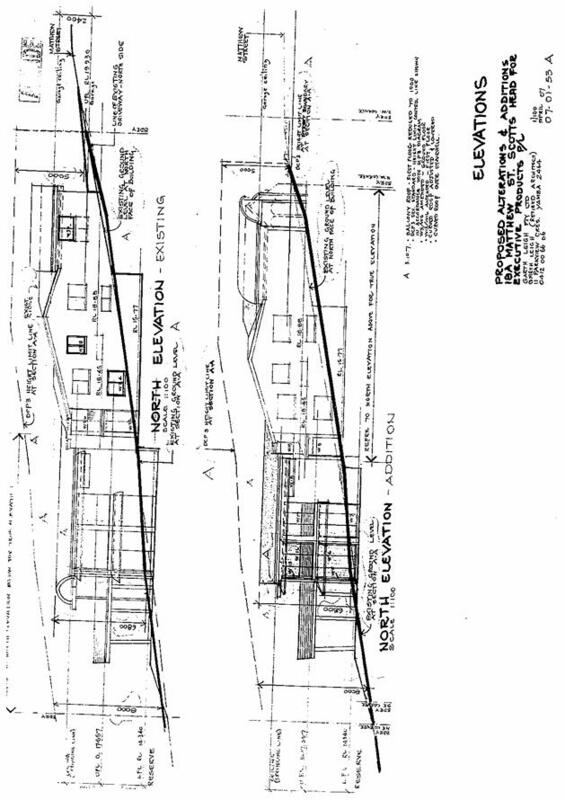 These alterations and additions are designed to complement the proposed additions and improve the streetscape appearance of the dwelling and allow the garages to be used by overcoming the slope of the land and excessive driveway grade. Notwithstanding that the height of the building is 6m at this point, it is considered that the proposal is still within the height plane interpretation and therefore complies. · There were concerns raised regarding the overshadowing effect that the proposed dwelling would have on adjoining property and residence. The only property which will be directly affected by this proposal is the adjoining property directly to the south of the development site. 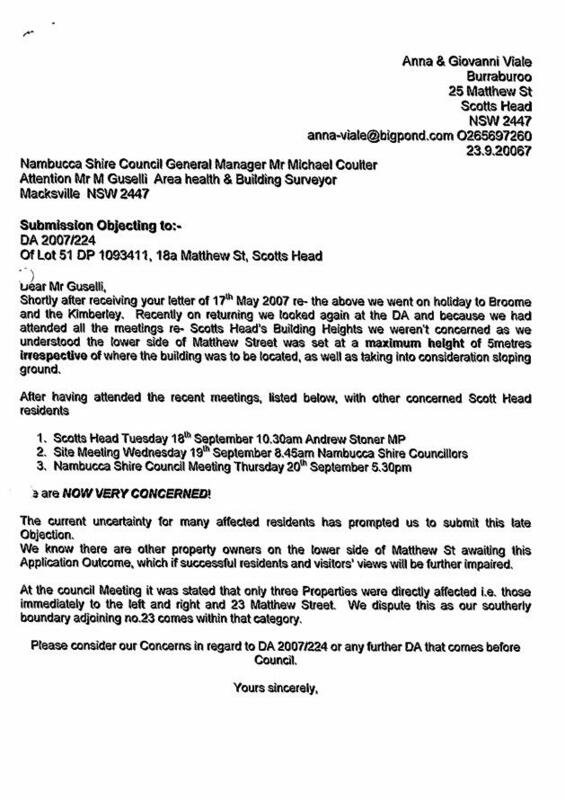 No submissions were received by Council from the affected property. It should also be noted that the neighbouring property on the southern boundary is old and dilapidated and likely to be redeveloped in the near future. If this were the case, the impacts of the overshadowing would be further alleviated. In response to this issue the applicant submitted solar access diagrams at 9am,12pm and 3pm. Given the timing of the application, coinciding with the winter solstice, it was possible to observe the existing and proposed shadows that would result from the development. A measuring pole was used to examine shadows that would be cast from the roof ridge and the walls of the proposed development. This demonstrated that the shadow diagrams that were submitted to Council were reasonably accurate and that the proposed additions would satisfy Council’s minimum requirements for solar access. · There were concerns raised regarding the floor area and site coverage of the proposed development. The allowable site coverage for a dwelling house is 65% of the available land. The development as proposed will cover 53.0% of the total site, which indicates that the development complies with Council’s requirements. 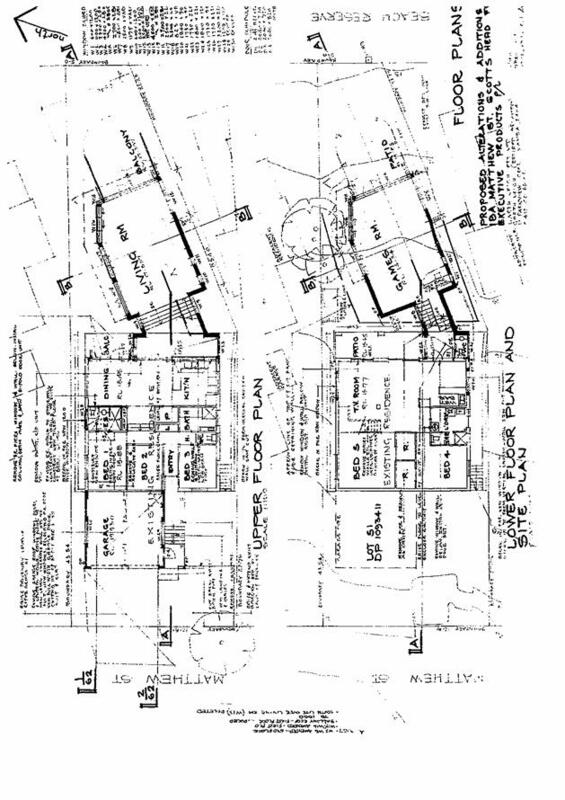 The submissions made in regard to this matter, relate the south facing brick wall of the additions, which is situated approximately 1m from the southern property boundary. The side setback complies with Council’s minimum requirements of 900mm. · Allegations have been made that the building has been used as tourist accommodation units without the consent of council. Concerns were raised that the addition could be another tourist accommodation area. The property at 18a Matthew Street has recently been sold to Executive Products Pty Ltd. The owners of this property have indicated that they wish to use this building as a single dwelling and that the proposal is to transform the existing building into a modern and well presented dwelling. Prior to the sale of this property, it was being rented out as two separate tourist units without Council approval. As there is currently no access to the garages because of the excessive driveway grade, this created problems of vehicles congesting Mathews Street. Several submissions felt that the proposed additions could exacerbate the car parking problem as the addition may be used for tourist accommodation units. Any approval of the proposed development will stipulate that the dwelling may not be used as separate tourist accommodation units without the prior approval of Council. The fact that part of the proposal involves rectifying the steep transitions from the driveway to the garages, this will allow for on-site car parking and reduce the congestion currently caused by vehicles parked on Matthew Street. · Concerns were raised regarding the obstruction of views resulting from the development. It is recognised that there will be some loss of views as a result of this proposal. However the views that will be partially obstructed are shared views which primarily exist over the development site. These views over adjoining properties should not be relied on as primary views. Adjoining dwellings will continue to maintain views of the water, irrespective of the development. It is not likely that the views from the coastal areas or foreshore reserve will be adversely affected as a result of this development. The dwelling additions are in keeping with examples of similar development in Mathews Street and the general locality. · There was concern raised as to the precedent that the approval of this structure would have on the character of the area in Matthew Street. When observing the many different styles, ages and sizes of the dwellings in Matthew Street it is difficult to define a character. It can be anticipated that the trend will be for land values in this area to continue to rise and the character and pressure for redevelopment in the area will be affected accordingly. If this development is approved as per the recommendations to Council it is anticipated that the addition will also encourage other dwellings on this street to redevelop and in an attempt to retain or improve views. Currently there is no minimum setback from the foreshore reserve, however the subject proposal maintains a 4m setback from the reserve. It is considered that a 4m setback is reasonable and it is expected that the issue of setbacks to the reserve and the development of areas with 5m height limits will be canvassed in the new DCP. It is evident that this development has raised public interest with the number of submissions being received. Council has the responsibility of balancing competing interests to prevent inappropriate development that may impact on the broader community, while allowing individual landowners the opportunity to develop the potential of their land. A consistent and reasonable application of development standards is important for Council to demonstrate that it is acting in the public interest. Currently Council has no building line setbacks from foreshore reserves and this should be a future consideration of Council in the preparation of the new DCP. The proposed development will have no adverse impacts on the natural environment, however the adoption of a building line setback to foreshore public reserves will have many environmental benefits by providing a clearly delineated buffer between private land and environmentally sensitive public land and preserving the distinctive character of the landscape setting. Apart from the benefit of a larger and more desirable living space for the occupants of the development, the proposal will have no social impacts on the broader community. It can be assumed that this type of development will become more common in the future, as landowners seek to develop in a contemporary and modern style that maintains the best possible outlook and views from the building. In time this phenomenon will alter the low density and small scale character of the area. Proper development assessment of applications is difficult where there are inconsistent interpretations and applications of development standards. It is in the interests of landowners and Council that a logical and consistent approach is agreed to, that allows for a fair and balanced assessment process. There are no significant economic implications arising from the development, but there may be costs to Council depending on the outcome of the determination and the likelihood of an appeal by the applicant. Council has sought legal advice in relation to the assessment of the development application to minimise the risk to Council and assist in the decision making process. The advice reinforced to Council that an adoption of a consistent approach to development control, combined with a proper assessment under Section 79C of the EP & A Act 1979, will mitigate any risks to Council that may arise following determination of an application. The advice noted the various inconsistencies and anomalies in the DCP and to the LEP, but highlighted that the weight afforded to the DCP provisions is a matter for the Council in its assessment of the application. There may be financial implications to Council arising from the determination of the development application. In accordance with the provisions of the EP&A Act, the applicant has the right of appeal should they be unhappy with the decision of Council. Alternatively they may take a deemed refusal if the application has not been determined within the required time-frame of 40 days. The objectors to an application may also seek to challenge a decision of Council on administrative or procedural grounds. In the event that the application is approved by Council, the responsibility would fall on the objectors to challenge the decision of Council on administrative or procedural grounds and demonstrate to the Court that Council had erred in its decision. In the event that the application is refused, Council may be forced to defend its decision in the Land and Environment Court. Given the recommendation for approval by the Planning Department, Council would be required to engage the services of an independent consultant to act on its behalf in defending its decision. 1 The development shall be carried out generally in accordance with the application and the documents lodged with Council on 14 May 2007 and 16 October 2007 and plan Nos 07-01-51A, 07-01-52A, 07-0153A, 07-01-54A, 07-01-56A, 07-01-57A, stamped and returned with this consent. Reason: To ensure development proceeds in accordance with approved plans. 2 Building works in accordance with this development consent, must not be commenced on-site until a Construction Certificate has been issued by the Principal Certifying Authority. Reason: To satisfy the relevant statutory requirements. 3 Occupation of the development shall not take place unless an Occupation Certificate has been submitted and approved by the Principal Certifying Authority. Reason: To ensure the development has been completed in accordance with Council requirements of consent. 4 The work must be carried out in accordance with the requirements of the Building Code of Australia. Reason: To satisfy the statutory provisions of the Building Code of Australia 2007. 5 In the case of residential building work for which the Home Building Act 1989 requires there to be a contract of insurance in force in accordance with Part 6 of that Act, that such a contract of insurance is in force before any building work authorised to be carried out by the consent, commences. Reason: To satisfy the statutory provisions of the Home Building Act 1989. 6 All building work must be carried out in accordance with the provisions of the Building Code of Australia. b adequate provision must be made for drainage. Reason: To satisfy the statutory requirements of the Protection of the Environment Operations Act, Clean Waters Reg 1972, Clean Air Reg 2002 and General Reg 1998.
iii stating that unauthorised entry to the work site is prohibited. Reason: To satisfy requirements of Clause 80 A(11) of the EP&A Act 1979 and Regulations 2000. 9 Toilet facilities are to be provided, at or in the vicinity of the work site on which work involved in the erection or demolition of a building is being carried out, at the rate of one toilet for every 20 persons or part of 20 persons employed at the site. 10 All building waste and miscellaneous refuse accumulated during the building’s construction must be contained in a lidded trade waste bin or skip. Note: Putrescible wastes must be separated from the building waste. 11 The proposed balcony addition shall be setback a minimum of 4 metres from the common property boundary adjoining the public reserve. Reason: To ensure adequate setback to the public reserve. 12 Fulfillment of the commitments listed in each relevant BASIX Certificate issued for the development. Reason: To ensure compliance with BASIX commitments and Section 97A(3) of the EP&A Regulation 2000". 13 Location and construction of vehicular access to the site in accordance with the requirements of Council’s Aus-Spec #1 Design and Construction Specification. Attention is drawn to the need to obtain Council approval for the location of the access prior to construction. Reason: To ensure a satisfactory standard of traffic safety is achieved. 14 The materials and colours of external features of any building, driveways, walkways or large paved areas shall be in colours that blend with the surrounding natural materials and shall be non-reflective. Reason: To minimise the visual impact of the development. 15 Submission of certified engineering plans and specifications for the construction of roadworks required by conditions 14 with Construction Certificate. Plans to be in accordance with the requirements of Council’s Aus-Spec #1 Design Specification. Reason: To ensure access will be constructed to a satisfactory engineering standard. 16 A separate application and consent under The Roads Act 1993 is required for any proposed construction work taking place within a Public Road Reserve (this includes construction involving machinery working on the development from an adjacent Public Road Reserve). This consent is to be obtained prior to issue of Construction Certificate. The form is to be completed and returned to Council along with the application and inspection fee of $91. 17 Any retaining walls necessitated due to excavation of filling adjacent to site boundaries shall be constructed to the requirements of Council in accordance with detailed structural engineering plans to be submitted to and approved by Council prior to such construction commencing. Reason: To ensure a satisfactory standard of construction to maintain land stability. · maintenance of proposed temporary structures. 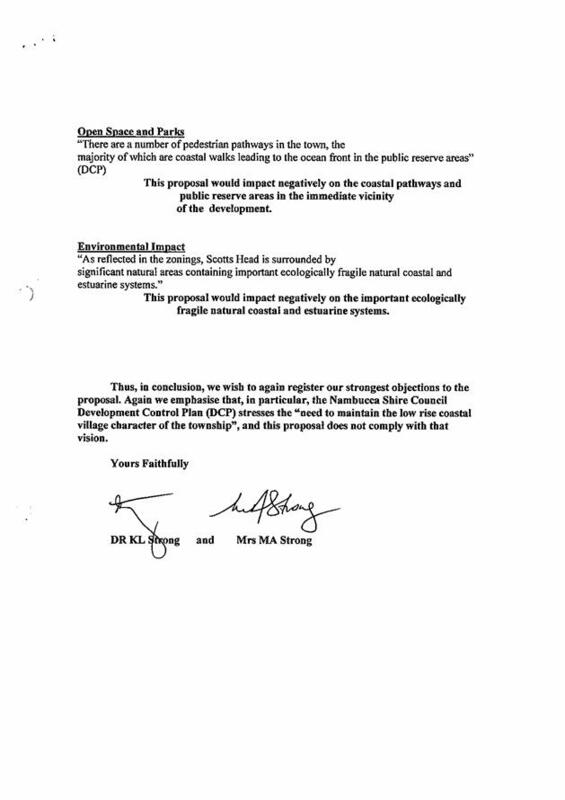 · any way that the development will permanently modify the landscape and drainage patterns (ie the environmental impact on the surrounding area). · plans should be prepared in conjunction with engineering design for all construction works and be included as part of the final engineering plans. Reason: To ensure management of soil and water impacts on-site. 19 Where Council is the Principal Certifying Authority, design details within this Wind Classification for the roof and wall frame bracing and tie downs, must be submitted prior to the frame inspection being carried out. Reason: To ensure structural integrity of the building. 20 Effective erosion and sediment control measures must be installed within the boundaries of the site during construction. These measures may consist of sediment fences, hay bales and/or sandbags. Care should be taken in locating material stockpiles, ie sand, soil, etc, and the number of vehicular movements should be restricted during inclement weather. Reason: To ensure erosion and sediment control. 21 All plumbing and drainage work shall be carried out by a licensed plumber and drainer and in accordance with AS 3500 and the National Plumbing and Drainage Code, NSW Plumbing and Drainage Code as applicable. Reason: To ensure compliance with the requirements of the Local Government Act. 22 Roof water guttering and downpipes shall be installed and roof water disposed of to Council’s satisfaction. Reason: To ensure compliance with the requirements of the Local Government Act and Policy. 23 A surface and/or sub-soil drainage system must be constructed and maintained so as to prevent water ponding about the curtilage of the building. Reason: To ensure the structural integrity of the building. 24 The treads and risers of the stairs must comply with Part 3.9.1 of the Building Code of Australia. (Risers between 115mm and 190mm, treads 240mm to 355mm). Reason: To maintain reasonable levels of safety. 25 For the purpose of safety and convenience, an approved balustrade shall be provided to any landing, verandah, balcony, stairway or sudden change of level within or associated with a building exceeding one metre above finished ground level and openings are not to permit a 125mm sphere to pass through. The finished height above floor or deck level shall be a minimum of 1 metre. Balconies over 4.0m above surrounding ground level must not have any horizontal member between 150mm and 760mm above the floor unless it does not facilitate climbing. If stainless steel, wire or similar balustrade is proposed, details must be provided in accordance with the BCA, prior to commencement of works on the balustrade. Reason: To ensure reasonable levels of safety for the occupants of the building. 26 A smoke alarm system must be installed in accordance with Part 3.7.2 of the Building Code of Australia 1996 for a dwelling. The smoke detectors must be connected to mains power and have a standby power supply. They are to be located on or near the ceiling in each storey and between bedroom areas and the rest of the house, or in the bedrooms. A Certificate from a licensed electrician shall be submitted to the Principal Certifying Authority on completion of the smoke detector installation stating the smoke alarm complies with AS 3786, and has been connected to the electrical mains in accordance with Part 3.7.2 of the Building Code of Australia Class 1 and Class 10 buildings. Reason: To maintain occupants safety and ensure compliance with installation. 27 A Survey Certificate for structural work to ensure that the maximum building height, at any one point, does not exceed 6.8m above the existing natural surface level at any point. 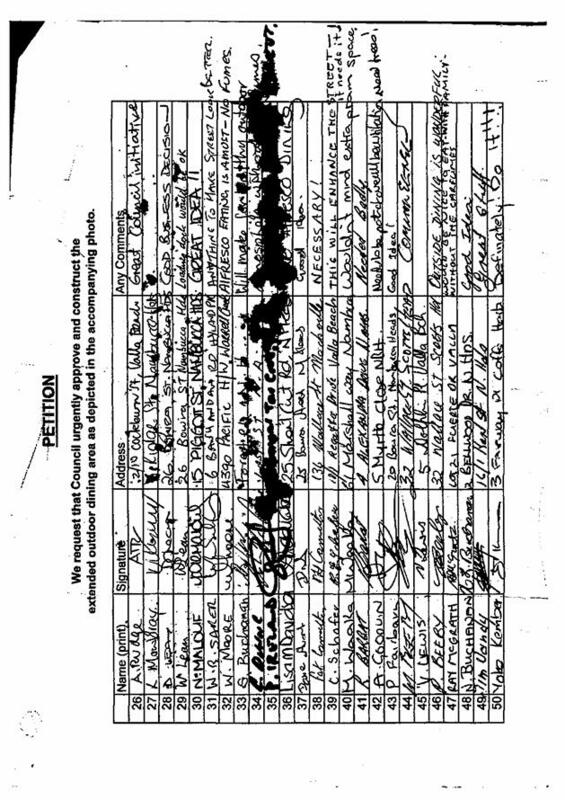 In this regard, a Surveyor's Certificate is required to be submitted with lodgement of the Construction Certificate, showing natural surface levels of the site to be occupied by the building and a further Surveyor's Certificate is required prior to the issue of the Occupation Certificate, showing the height limitation has been adhered to. Reason: To ensure the development complies with Council's height requirements. 28 No part of the dwelling shall be used nor adapted to be used as a separately occupiable domicile. Reason: As required by the EP&A Act. and is given appropriate information and declarations under paragraphs (a) and (b) whenever arrangements for the doing of the work are changed in such a manner as to render out of date any information or declaration previously given under either of those paragraphs. Note: The amount referred to in paragraph (b)(ii) is prescribed by regulations under the Home Building Act 1989. As at the date on which this Regulation was Gazetted, that amount was $5,000. As those regulations are amended from time to time, so that amount may vary. It must be noted that if work is valued at over $12,000 (which includes the combined total costs of all works to be carried out) prior to receiving the Owner-Builder Certificate, a course will need to be attended. b A certificate purporting to be issued by an approved insurer under Part 6 of the Home Building Act 1989 that states that a person is the holder of an insurance policy issued for the purposes of that Part is, for the purposes of this Clause, sufficient evidence that the person has complied with the requirements of that Part. Precaution should be taken to minimise any excavation carried out as part of the construction process as the subject land has been identified as potentially having a high probability of acid sulfate soils within a depth of 1-3 metres below the ground surface. Environmental risk may result if the soil material is disturbed by activities such as excavation. Prior to any inspections being carried out Council requires confirmation that the site to be visited including access and egress, is a safe place of work in accordance with the Occupational Health and Safety Act 2000. Note: Council staff have discretion to refuse to enter unsafe sites. Refusal to enter a site will require rescheduling of the inspection and additional fees paid. Continual failure to provide a safe work site will be reported to WorkCover. Hours of operating power machinery are set by the Environment Protection Authority. In general, these hours are between 7.00 am and 6.00 pm on weekdays and between 8.00 am and 6.00 pm on weekends and public holidays. Council seeks your co-operation in adhering to these hours when working near residential premises. The development is within 1km of breaking surf and is therefore subject to severe exposure conditions, care should be taken in selection of building products in relation to corrosion and exposure to salt. The manufacturer of selected products should be consulted where uncertainties are raised. A development application has been submitted to Council by Abigroup for the establishment and operation of a Pre-Cast Concrete Facility on industrial zoned land within the Macksville Industrial Estate. The proposed development will supply concrete products, primarily reinforced concrete beams for contracted Abigroup road works. The development site was the preferred location for Abigroup to establish their facility, because of its close proximity to the Pacific Highway, its strategic location within the mid north coast of NSW and ability to supply the highway upgrades planned in the region. Council recognises that the development has the potential to generate many positive benefits to the local economy and has therefore been proactive in its discussions with Abigroup and other Government authorities to ascertain what requirements are necessary to enable the development to proceed. A major consideration is that the proposal will bring forward the planned replacement of the Upper Warrell Creek Railway Bridge and require upgrade of the Council road either side of the bridge. A proposal by the applicant for a Voluntary Planning Agreement (VPA) between Council and Abigroup for a monetary contribution towards the replacement of the railway bridge has been received. 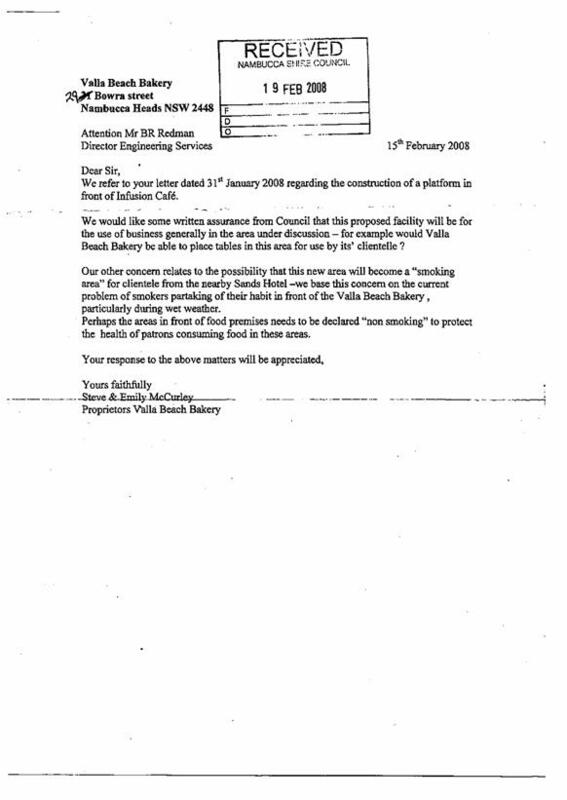 A copy of the letter of offer made by Abigroup, dated 27 February 2008, is attached for Council’s information. It is considered that the proposed development is an efficient and appropriate use of industrial zoned land and worthy of Council’s support. However, in the absence of a finalised Planning Agreement (PA), it is recommended that a deferred commencement consent be granted to the proposal, with the requirement that a PA be prepared and placed on public exhibition and entered into by the respective parties, prior to operation of the development consent. 1 That development application 2008/139 be granted deferred commencement consent (conditions attached) that requires a Planning Agreement to be entered into before the consent becomes operational. It is not considered that Council can issue a consent in the absence of a formal Planning Agreement in accordance with section 80A(1) of the Environmental Planning and Assessment Act 1979. An alternative option to issuing a deferred commencement consent may be to notify the PA and consider any submissions before final determination of the development application. The application has been considered by Council’s Operations and Technical Services and Health and Building Departments who raised no issues or concerns with the proposal that would preclude approval of the application. 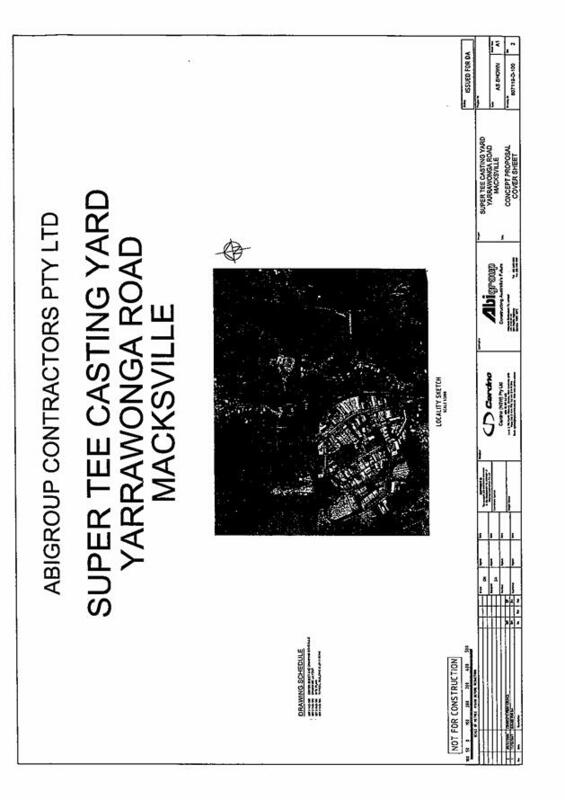 The proposal is located on part of Lot 4 in DP 549892 at the northern end of Yarrawonga Street, Macksville. The development site forms part of a large allotment of industrial zoned land which is currently under construction with bulk earthworks proceeding in accordance with condition of consent for the subdivision of the land. A site office, workshop and 3 large steel framed sheds will be erected in conjunction with the development. Secure bunded areas will be provided for storage of lubricating oils, chemicals and fuel. A concrete wash bay will be installed for the storage and recycling of waste water from the production process. It is anticipated that the development will generate many positive benefits for the local economy, both directly and indirectly. The concrete casting yard will employ 50 full time staff as well as providing employment for equipment operators and associated service personnel. The development also has the real potential to support the growth and long term viability of the area by attracting further interest and development of complementary industries within the industrial estate. Since the lodgement of the development application, Council has been in discussions with Abigroup and Government authorities to ascertain what requirements are necessary to enable the development to proceed. The subject site is difficult to access over the Upper Warrell Creek Road railway bridge. As such the bridge will need to be replaced to provide improved access for not only the proposed development, but also the existing and future industrial and residential development in the South Macksville precinct. A proposal by the applicant for a Voluntary Planning Agreement (VPA) between Council and Abigroup for a monetary contribution towards the replacement of the bridge has been received. 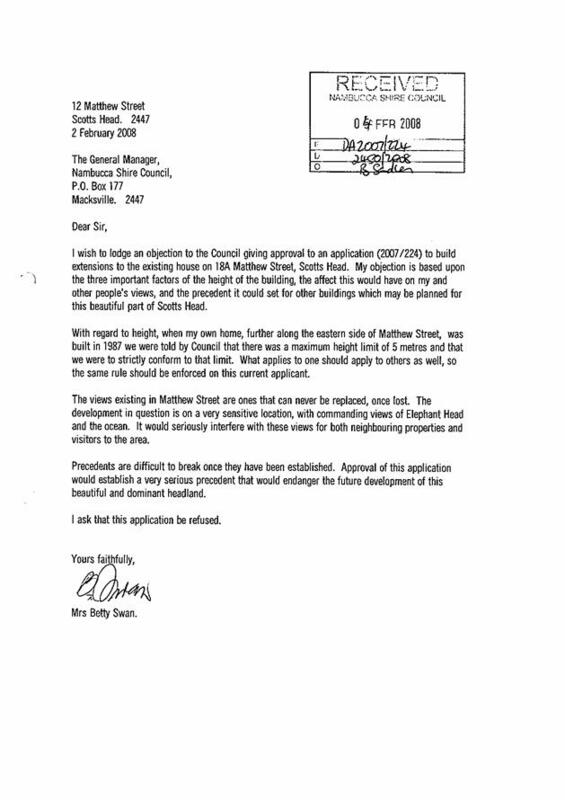 A copy of the letter of offer made by Abigroup, dated 27 February 2008, is attached for Council’s information. The additional funds will enable the planned replacement of the Upper Warrell Creek Railway Bridge and require upgrade of the Council road either side of the bridge to be brought forward. It is considered that the proposal is an efficient and appropriate use of industrial zoned land and worthy of Council’s support. However, in the absence of a finalised Planning Agreement, it is recommended that a deferred commencement consent be granted to the proposal, with the requirement that a PA be prepared and placed on public exhibition and entered into by the respective parties, prior to operation of the development consent. The subject land is zoned 4(a) General Industrial pursuant to the provisions of Nambucca Local Environmental Plan 1995. 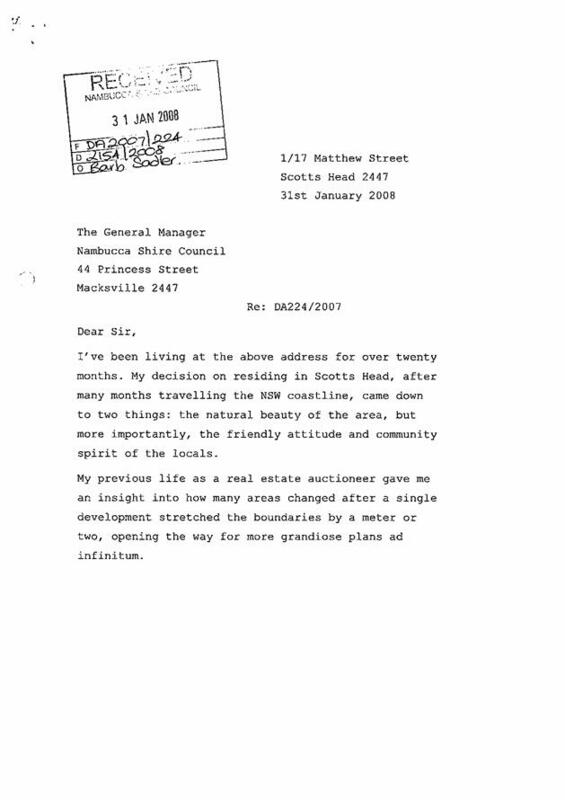 The development is permissible with Council’s development consent in the zone. It is also considered that the proposal complies with the objectives of the zoning. Clause 47 of NCREP 1998 relates to plan preparation and development control principles for commercial and industrial development. The development complies with the relevant requirements by demonstrating that the land is capable of being serviced and provides adequate access and is in close proximity to urban areas. There are no draft environmental planning instruments which are applicable to the development. Council’s DCP 5 Industrial Development applies to the proposal. The development is consistent with all requirements of the DCP. The applicant has agreed to enter into a VPA with Council in relation to the replacement of the railway bridge and associated works. The proposal is likely to generate an average of 40 traffic movements per day in an existing industrial area, which is reasonably expected. At least 20 vehicle movements per day will be the delivery of pre-mixed concrete, which will be sourced locally. At this stage the nearest supply point would be Macksville followed by Nambucca Heads, however it may eventuate that a concrete supplier is prepared to locate within the Macksville Industrial Estate to secure the demand requirements of Abigroup. The development is not listed on Schedule 1 or 2 of the SEPP. c if the land requires remediation to be made suitable for the purpose for which the development is proposed to be carried out, it is satisfied that the land will be remediated before the land is used for that purpose. Given that the development site is currently under construction with clean fill material, it is unlikely that the site is contaminated and the SEPP is therefore not considered relevant to the proposal. Clause 8 of the SEPP is however relevant as it requires that the consent authority to consider the following matters when determining and development application when development occurs on land to which the SEPP applies. The Coastal Policy was prepared to co-ordinate the management of the coast by identifying, in a single document, the State’s various management policies, programs and standards as they apply to a defined coastal zone. The NSW Coastal Policy has as its central focus the ecologically sustainable development (ESD) of the NSW coastline. This is in recognition of the fact that the coast is the focus of intense pressures from human activity and that there are a large range of competing interests for its resources. Although the Proposal does occur within the coastal zone the proposed development is not inconsistent with the NSW Coastal Policy. It is expected that the maximum amount of 25,000 tonnes of concrete product would be manufactured each year. This is below the threshold of 150 tonnes per day or 30,000 tonnes per year of concrete products. Production above these thresholds would require an Environmental Protection Licence under the Protection of the Environment Operations Act and would be considered designated development under the EPA Act. Pre-mix concrete and other products used in the production method will be delivered to the site via the Pacific Highway and over the Upper Warrell Creek Railway Bridge. It may eventuate that supplies can be sourced directly from the Macksville Industrial Estate subject to the establishment of new businesses (such as a concrete batching plant) into the area. At this stage it appears likely that the Abigroup development will attract complementary businesses to the industrial estate and Council has had tentative discussions with developers in this regard. It is expected that a maximum of 40 vehicle movements a day would occur during peak production. Given that traffic volumes on local roads are already influenced by the township and the industrial estate, these volumes are unlikely to have any discernable impact. Concrete products will exit the site via Yarrawonga Street and over the railway bridge typically during plant operational hours. Deliveries will likely also occur outside of normal operating hours depending on the requirements of the RTA, destination of the product and the availability of vehicle escorts. To facilitate the delivery of concrete beams off-site, the railway bridge will need to be replaced and the roads either side of the bridge will need to be upgraded to accommodate delivery vehicles. Water usage in the production process is significant and recycled water is proposed in addition to the use of Council’s mains water supply. It is estimated that the facility will use 53,000L/day of town water per day, with 25,000L/day recovered on the site. Mains supply town water will be used for potable use and some production use. Recycled water (from storage pits) and captured storm water will be used in the production process for concrete casing. Waste water (concrete wash area) will be reused continuously to wash the concrete truck chutes. Excess of waste water will be used for dust control over the gravel surface of the yard where necessary. Periodically the waste water sediment not able to be recycled, will be removed from the site using a licensed contractor. Section 64 charges will be applicable to the development based on mains water consumption at the pre-cast facility, but excluding the water required in the production of the concrete. Council’s Manager of Water and Sewer has calculated that the consumption rates will be equivalent to 72 equivalent tenements which equates to $286,000. A developer contribution will be levied from Abigroup for this amount. A Stormwater strategy plan has been submitted with the application indicating that all stormwater from the site will be collected and treated in stages to prevent contamination from various pollutants including nutrients and suspended solids. The existing detention pond will form an important part of the strategy by assisting in the containment and treatment process to ensure that water quality is unlikely to be adversely affected. Waste water from the concrete truck washing area is collected and then flows to storage pits. Solid materials in these pits settles and forms a sludge which is periodically removed. Each of these pits will flow to a central pit. Recycled water from the curing operation will be collected in a grated drain and then flow to storage tanks. Any rainfall will directed into the internally designed storm water system and directed into the storage tanks or council storm water system. The run off water will be directed into the first flush stormwater system. The nearest sensitive noise receivers not associated with the proposal is an area of low density housing on the eastern side of the Railway, some distance from the site and screened by remnant vegetation beside the railway. There are also some houses along the proposed haul route on Upper Warrell Creek Road. All of these receivers are already affected by the existing Railway and to a certain extent the existing industrial estate. The operation of the facility is not likely to generate offensive noise, audible to residences. The Study Area is located in an Industrial subdivision and as such some very localised impacts to air quality could be excepted from this use. Emissions to air during operations would be limited to exhaust from concrete delivery trucks, rebar-low trucks, general trucks, low-bed segment transporters and staff vehicles Emissions from plant and machinery are expected to be low and unlikely to be of nuisance to any sensitive receivers. Impacts on flora and fauna are expected to be negligible or none. The site of the proposed casting yard would have already been cleared as a result of the approved subdivision. The site of the proposed casting yard contains no native vegetation and as such is unlikely to support any habitat for any flora or fauna protected or otherwise. · General waste such as plastic, cardboard and machine parts (eg oil filters and drums). All liquid waste as a result of concrete washout would be either reused for further washing operations or disposed of via a licensed liquid waste facility. Concrete sludge would be allowed to dry and either recycled for use in road base or disposed of at a licensed landfill. There is potential for a chemical spill, however secure storage and bunding will minimis the risk of a spill. A number of sites in Taree, Kempsey, Nambucca, Coffs Harbour and Grafton were investigated by Abigroup to determine their suitability for the proposal. Ultimately it was considered that Macksville satisfied the criteria for suitability. The subdivision site is zoned industrial to facilitate this type of development. The staged development of the land is considered to be an orderly and predictable extension to adjoining industrial development. Reticulated sewer and water are available to service the proposal. Consultation with Country Energy as part of the Original SEE for the Industrial subdivision indicates that there is adequate power supply to support the subdivision. The application has been notified to adjoining landowners including all those properties which previously made a submission to the original subdivision of the land. 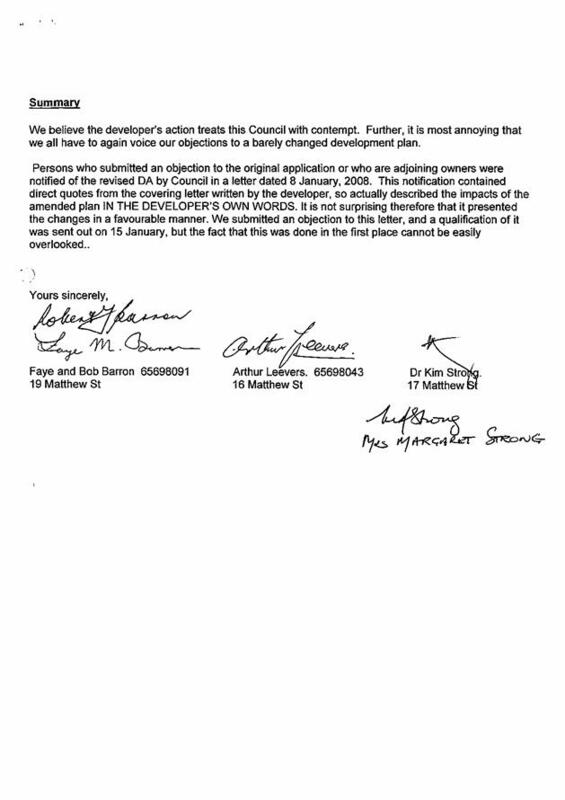 The notification attracted 2 submissions objecting to the proposal, copies of which are attached for Council’s information. 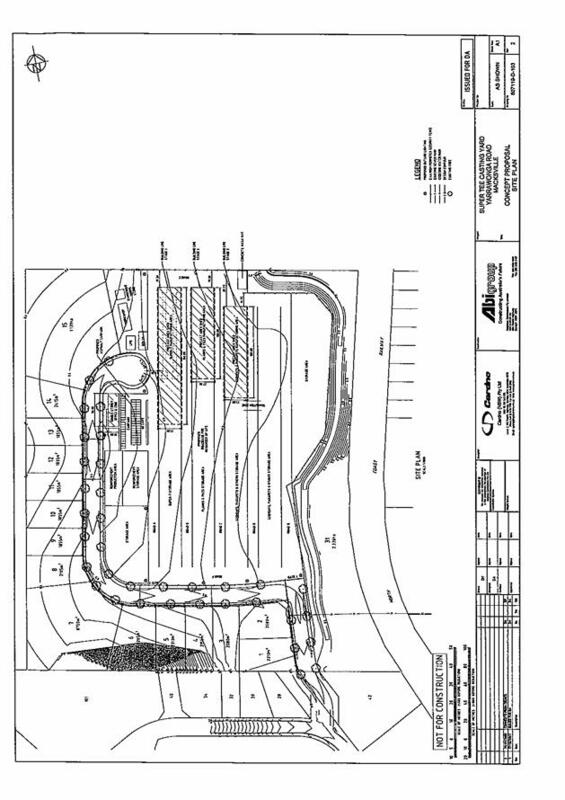 · One of the submissions (from a directly adjoining landowner) argued that the proposal would result in additional stormwater runoff onto his rural property. A requirement on the original industrial subdivision of the land was the construction of a watercourse along the eastern boundary of the site to manage stormwater runoff. The works are currently proceeding in accordance with permits and approval issued by the Department of Natural Resources. It is the intention of Abigroup to retain stormwater on site for reuse, effectively limiting discharge to the watercourse. · One of the submissions argued that the proposal would result in a loss of amenity to residential dwellings located in nearby residential release areas. It is evident that this development has raised interest from the public and from developers investigating the potential of the area for investment opportunities. Council has the responsibility of balancing competing interests to prevent inappropriate development that may impact on the community, while allowing developers the opportunity to develop the potential of the land. 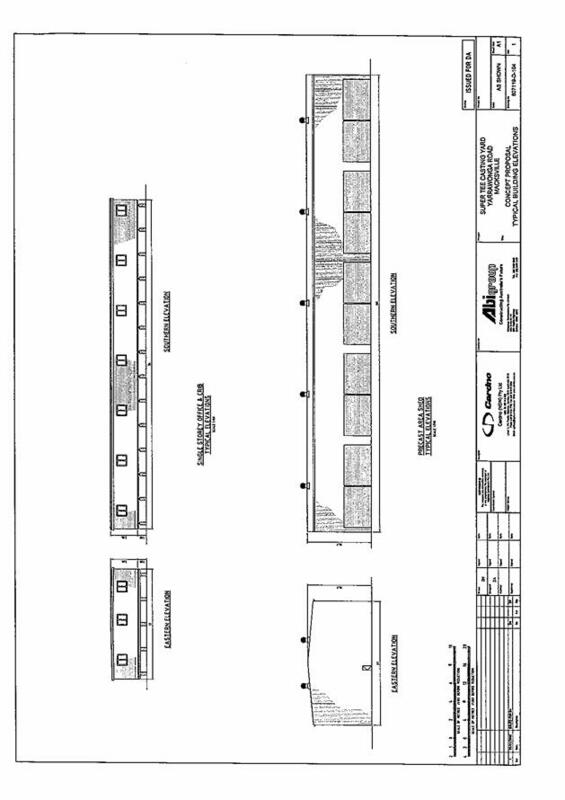 The development is considered an appropriate land use within the industrial area. These environmental risks and impacts have been assessed and environmental management measures proposed to be incorporated into the project to minimise the likelihood of impacts occurring. On balance, the project would provide valuable material to critical government infrastructure projects as well as other potential projects in the future. The site of the proposed casting yard is within an Industrial site and as such fits with the surrounding land use. Given the small potential risks and impacts to the environment from the quarries, it is considered that the project is justified. The project has the potential to result in positive social outcomes through employment generation and business development. It is not foreseeable that the development will result in any negative social impacts. The development will have positive impacts for the local economy directly through employment generation and indirectly through further investment opportunities. The establishment of the facility in the industrial estate will assist in consolidating other complementary industries to the area, in response to the Abigroup development. All of the potential adverse impacts outlined in this report can be mitigated through appropriate construction and rehabilitation practices. Safeguards would assist in reducing any environmental social and economic impacts of the proposal to an acceptable level. The development has the potential to have immediate and recurrent benefits for the area as discussed previously. The replacement of the railway bridge has always been forecast, and the development will bring forward and provide some impetus to this occurring. The costs to Council for the replacement of the bridge are largely unavoidable and Council is in a fortunate position to have the assistance of Abigroup in this regard. 1 "Deferred Commencement" consent is granted pursuant to Clause 80(3) of the Environmental Planning and Assessment Act 1979 subject to Condition No 2 being addressed to Council's satisfaction before the consent can operate. This matter must be addressed within 12 months from the date of this notice. 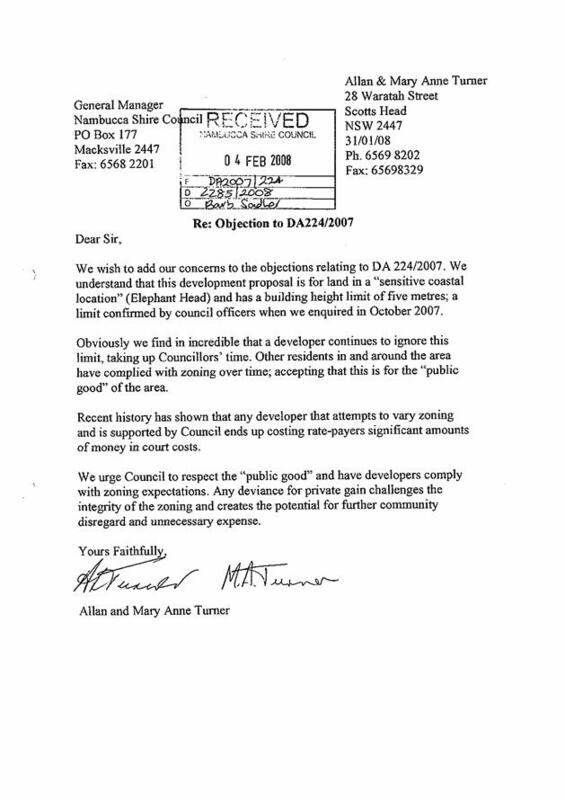 Reason: To ensure development proceeds only after certain specified matters are addressed to Council’s satisfaction. a Pursuant to Section 80A(1) of the Environmental Planning and Assessment Act 1979, a planning agreement in accordance with the offer made by Abigroup (letter dated 27 February 2008) that relates to the development application the subject of this consent, shall be prepared, publicly exhibited and entered into by respective parties. Reason: To ensure development proceeds only after exhibition of the Planning Agreement. 3 The development shall be carried out generally in accordance with the application and the documents lodged with Council on 24 December 2007 and plan Nos 607119-D-102 Rev 1, 607119-D-103 Rev 2, 607119-D-104 Rev 1. stamped and returned with this consent, or modified by any of the following conditions of consent requiring submission of amended plans for Council approval. 4 Building works in accordance with this development consent, must not be commenced on-site until a Construction Certificate has been issued by the Principal Certifying Authority. 5 The building is not to be occupied until all conditions of Council’s consent have been complied with to the satisfaction of Council and an Occupation Certificate has been obtained. Reason: To ensure satisfaction of Council’s conditions of consent prior to occupation. 6 The work must be carried out in accordance with the requirements of the Building Code of Australia. 7 A separate application and consent under The Roads Act 1993 is required for any proposed construction work taking place within a Public Road Reserve (this includes construction involving machinery working on the development from an adjacent Public Road Reserve). This consent is to be obtained prior to issue of the construction certificate. 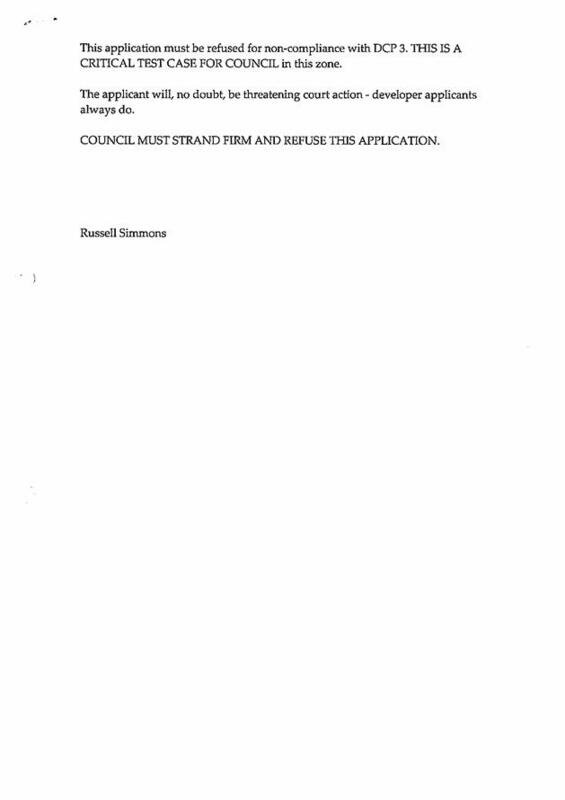 A copy of the form enclosed with the Development Application Determination is to be completed and returned to Council along with the application and inspection fee of $91. a Install a temporary structure on land – Part A.
b Install, alter, disconnect or remove a water meter connected to a service pipe – Part B.
c Carry out stormwater drainage work – Part B.
d Connect a private drain or sewer with a public drain or sewer under the control of Council or with a drain or sewer which connects with such a public drain or sewer – Part B.
e Dispose of waste into a sewer of the Council (trade waste) – Part C.
Reason: To ensure compliance with the requirements of the Local Government Act 1993 and Regulations and provisions of the Building Code of Australia. 9 Any approved vehicle wash bay to service the proposed development must be approved and all water used in the car wash bay must drain to Council’s sewer following treatment in an oil plate separator or other system as approved by Council. Full details of the proposal must be submitted to Council for approval prior to the Construction Certificate being issued. Reason: To maintain water quality of downstream drainage system. 10 The aboveground fuel and LPG tank(s) must meet the requirements of the WorkCover Authority and comply with the relevant Australian Standards. Full details of how these requirements are met, must be included on the Construction Certificate application and plans. 11 Effective erosion and sediment control measures must be installed within the boundaries of the site prior to and during construction and be maintained until the site has been efficiently rehabilitated, turfed or landscaped. Should Council be the Principal Certifying Authority, details as to the method of complying with the above must be submitted prior to the release of the Construction Certificate. These measures may consist of sediment fences, hay bales and/or sandbags. Care should be taken in locating material stockpiles ie sand, soil, etc, and the number of vehicular movements should be restricted during inclement weather. Reason: To ensure that control of erosion, sedimentation, other forms of pollution and site rehabilitation, are carried out to an acceptable standard as recommended by State Government Authorities. 13 Provision must be made for access to the commercial floor space for people with disabilities in accordance with AS1428.1 2001 "Design for Access and Mobility Part 1: General Requirements for Access - Buildings". Reason: To ensure satisfactory means of access for disabled persons. 14 The applicant shall pay to Council, prior to the issue of the Occupation Certificate, the following contributions for water and sewerage augmentation works, at the current rate of payment. 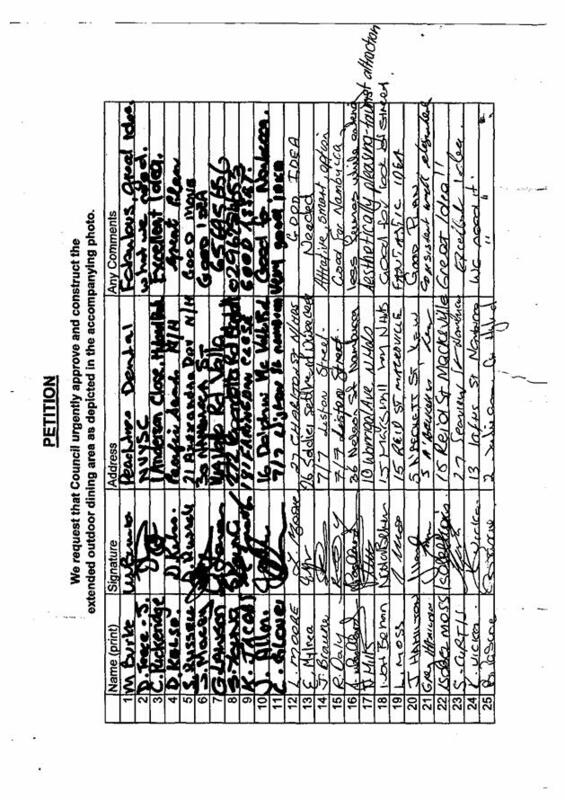 The contribution rates are those that apply at the date of issue of this consent. Rates are adjusted annually on 1 July. Contributions will only be accepted at the rate applying at the date of payment. Council's Environment and Community Planning Department should be contacted prior to payment to confirm the required development rate. a Council's water supply system and sewerage treatment works, pump stations and rising mains, a contribution of $286,000 (based on water directive calculations for equivalent tenements). Reason: To ensure the development contributes towards the cost of augmenting Council’s services pursuant to Section 64 of the Local Government Act 1993. 15 The provision by the applicant, at his expense, of the following works and services in accordance with Council’s Aus-Spec #1 Design and Construction Specifications and its Water and Sewerage Construction Specifications prior to release of the Occupation Certificate. d Construction of Council's standard heavy duty industrial crossing to suit the access to the site with a minimum width of 6m. The crossover shall be constructed of concrete a minimum 200mm thick and reinforced with SL82 mesh. e All stormwater run-off from the development to be collected within the property and discharged to an existing drainage system approved by Council in accordance with the requirements of Council’s Aus-Spec #1 Design and Construction Specifications. Runoff detention/retention and sediment interception measures shall be installed and maintained to reduce flow velocities and to prevent sand, aggregate, roadbase, spoil, or other sediment from entering any downstream watercourses or water bodies. Details to be provided, together with supporting calculations for the sizing of ponds, outlets and overflow structures. Details to be provided in relation to the potential for water storage from roof runoff including location of tanks, storage capacity and reuse. f Stormwater runoff from the gravel sealed car park shall be collected and treated in a oil and grit trap prior to discharge to council’s stormwater system unless developer can demonstrate that an appropriate alternative treatment will be adopted. 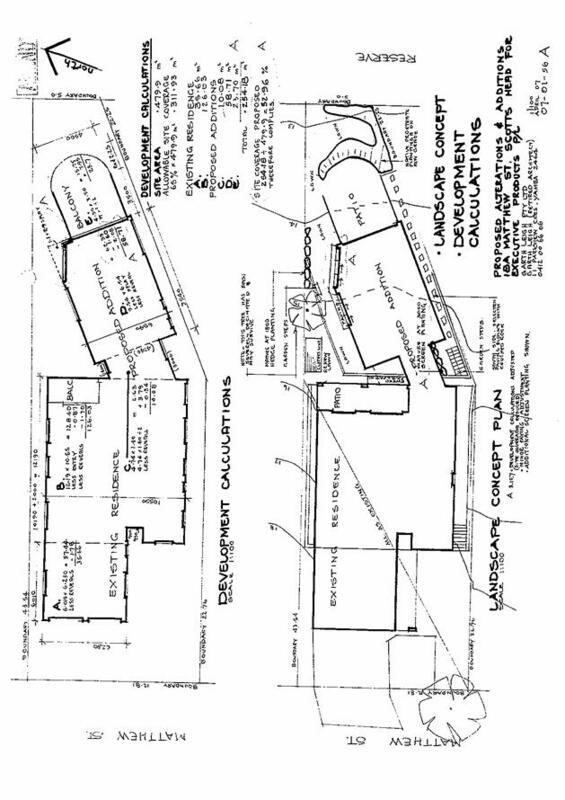 g Submission of certified engineering plans detailing work and services specified by this consent, for approval by Council prior to release of the Construction Certificate. Reason: To ensure the development is undertaken in accordance with accepted service and Engineering standards. Reason: To ensure public utility services, access and restrictions are legalised over the land. 17 Provision of a minimum 60 vehicle spaces on-site sealed, marked and drained in accordance with Council’s Aus-Spec #1 Design and Construction Specifications and Council’s Off-Street Parking Code”. Reason: To ensure adequate on-site car parking is provided. 18 All internal roadways must be constructed to an all-weather gravel or bitumen surface in accordance with Council’s Aus-Spec #1 Design and Construction Specifications. Reason: To ensure a satisfactory standard of internal access is achieved. 19 Proponent to submit relevant detail of trade waste generation and proposed pre-treatment of Tradewaste (where required) via Council’s approved form (Application for Approval to Discharge Trade Waste to Sewer). Reason: To ensure adequate disposal of trade waste. 20 Discharge of trade waste to Council’s sewer will not be permitted until formal approval for the discharge has been received from Council. 21 Storage areas fronting the public road shall be suitable screened from view with landscaping. Reason: To improve the amenity of the area and minimise unsightly visual impacts. 22 Provision of adequate storage facilities for industrial and domestic wastes to the requirements of the Principal Certifying Authority. Reason: To ensure reasonable standards of health and amenity to the occupants and neighbouring properties. 23 All waste oil, grease and associated products must be stored in suitable containers and be transferred to a waste disposal depot or recycling facility, approved for the reception of such materials. Full details and proof of disposal must be kept on the premises for perusal by Council. 24 To ensure hazardous and toxic materials are not a threat to the environment they must be stored in accordance with WorkCover Authority requirements. All tanks, drums and containers of toxic and hazardous materials shall be stored in a bunded area. The bund walls and floor shall be constructed of impervious materials and shall be of sufficient size to contain 110% of the volume of the largest tank plus the volume displaced by any additional tanks within the bunded area. Reason: To minimise threat to the environment from hazardous and toxic materials. 25 All vehicles associated with the industrial building or the use therein shall be located wholly within the site. Reason: To ensure parking associated with the development does not affect traffic use of the adjoining road. 26 All loading and unloading in connection with the use must be carried out wholly within the property. Reason: To ensure free-flow of vehicular and pedestrian traffic on public road reserves. 27 The development shall be conducted in such a manner so as not to interfere with the amenity of the neighbourhood, in respect of noise, vibration, smell, dust, waste water, waste products or otherwise. Reason: To prevent damage or nuisance to neighbours and adjoining property. 28 The use of the premises, building services, equipment, machinery and, ancillary fittings shall not give rise to an "offensive noise" as defined under the provisions of the Protection of the Environment Operations Act, 1997. Reason: To protect the amenity of adjoining occupations. The said contribution will be indexed and adjusted annually as from the date the consent became effective, in accordance with the Consumer Price Index applicable to each year ending 30 June, commencing 1 July for the duration of the development consent and the said adjustment to the contribution shall take effect from and including July each year, commencing 30 June for the duration of the consent. Council is advised that recruitment is commencing to replace workers in two vacant positions within the Department Environment and Planning, Community Services section. The positions are Youth Worker (Aboriginal) and Community Development Officer (Aboriginal). Both positions are funded by the Department of Community Services and have been reviewed in line with available funding and the requirements of the funding body. That review has resulted in some changes to the positions’ status and description. That Council note the review of the Youth Worker and Community Development Officer positions and the commencement of recruitment to fill the two vacancies. As these two positions are in Council’s Organisational Structure no other options are being presented. Nambucca Shire Council currently receives funding for two community services positions which are vacant following employee resignations last year. The vacancies have created the opportunity for Council staff to review the positions and their future status. Following the review of this position, the title has been changed to better clarify the role (it was Community Worker which tends to be one-on-one case work), and to align it with the other community development role at Council – the Youth Development Officer (YDO). It also signifies a fresh approach. Funding for the position is recurrent at a level which will provide for 4 days per week with appointment being subject to receipt of ongoing funding. The review has also confirmed that the position is to be designated for an indigenous worker. The Position Description has also been reviewed to ensure maximum outcomes for Council and the community and to provide some clear parameters for the employee. The role is that of planning, developing or delivering community building activities or events, and fostering strong and positive connections between Council and the community. The focus of this position is the development, co-ordination and delivery of a range of programs for young people (12 to 18 years) with a focus on indigenous youth – includes the School Holiday Activities and working with Council’s YDO on specific programs such as Resilient Young People Program in schools and Youth Week. The role also includes referral of young people to places where they can get support and assistance with life matters. The Position Description has also been reviewed to better clarify the role and the requirements and expectations of the position. This position is also designated for an indigenous worker. Council may recall that in July 2007 it resolved (upon a recommendation from the Aboriginal Community Advisory Committee) that at its September Budget Review it would consider an increase in the position to full-time. A review of project finances has revealed that a top-up from Council is not necessary to move the position to full-time at least in the short to medium term. Therefore the position is being offered at 5 days per week for the first 12 months, reverting to 4 days per week from July 2009 if no additional funding becomes available from either Council or the funding body at that point. There are no environmental impacts as a result of the recommendation. The positive potential impacts which may result from these positions are far reaching and include increased well-being and resilience to the development of life skills eg through youth programs. Council’s management of this funding has a positive economic impact via the provision of 2 positions at Council. There are no specific risks identified as a result of this report. Risk Assessments are completed for individual events and activities. As the positions are fully funded there is a neutral affect on the budget. The Community Development Officer is funded by the Department of Community Services under its Community Services Grants Program. The Youth Worker is funded by the Department of Community Services under its Aboriginal Child, Youth and Family Strategy. Some funding has been set aside while the position has been vacant which is sufficient to provide for the position at full-time until June 2009. The proposal to create a dining platform within two (2) carparking bays in front of Infusion Café has been advised to the two neighbouring business and given public exhibition on the premises. One business has replied seeking joint use of the platform. A petition signed by customers of Infusion has been submitted in support. 1 That Council approve the fabrication and placement of a relocatable dining platform in front of Infusion Café as part of the Bowra Streetscape Project subject to development approval. 2 That Infusion Café be given use of the platform at no charge for twelve (12) months with future payments based on the lease value of the extra footpath space and reimbursement of a component of the lost parking at 25% of the lease value in 2009, 50% in 2010 and a review of all footpath leasing in 2011. 3 That the Infusion Café register the additional tables and chairs as required by Council's policy. 1 Approve the construction of the platform in front of Infusion Café. 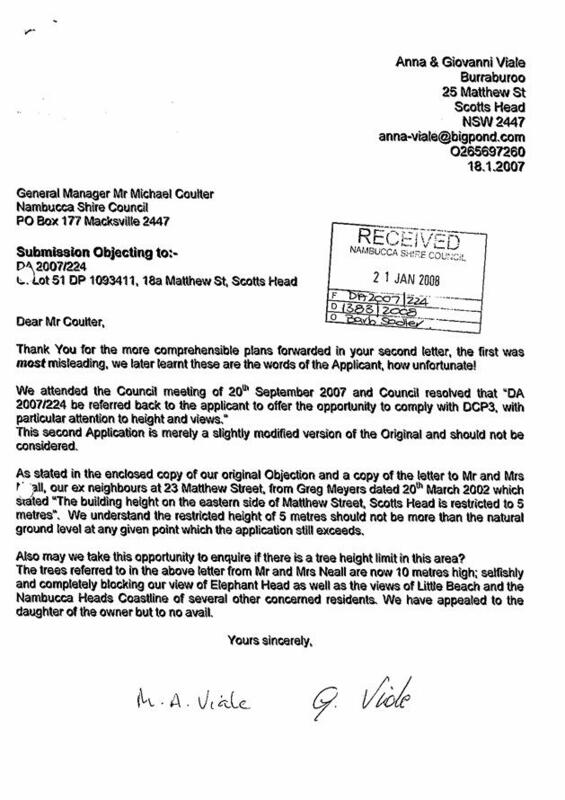 The proposal to construct and place a platform within two (2) car parking spaces in Bowra Street, Nambucca Heads was placed before Council on 17 January 2008. It was resolved that further consultation with other businesses be undertaken and the plans be put on public exhibition. A letter with plans of the proposal was sent directly to the businesses either side of Infusion Café being the ones most likely to be affected. In addition, the Infusion Café was asked to demonstrate customer support for the idea. This approach was taken to generate public feedback as a static display in the Library, for example, is unlikely to create a response. · Valla Beach Bakery (northern neighbouring business)—They believe that the area should be available for the use of all businesses generally. This is not possible as Infusion Café will be asked to pay an increasing lease fee. 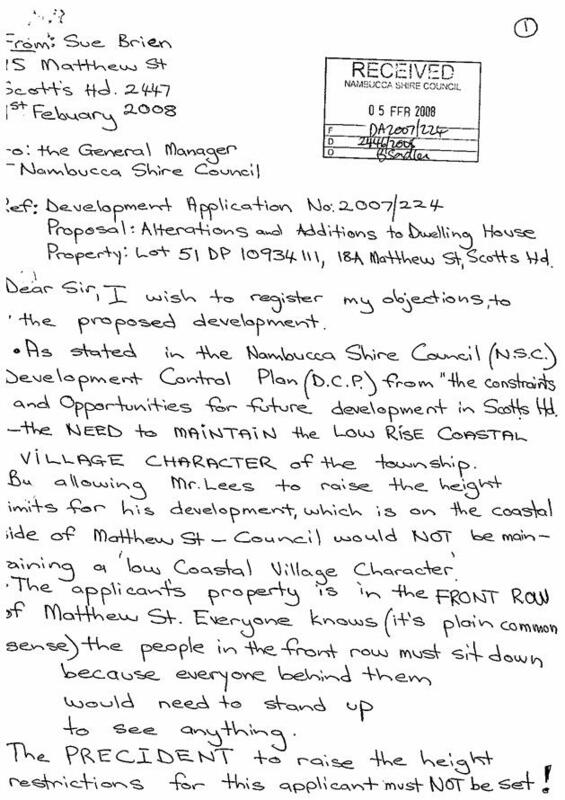 Letter from Valla Beach Baker attached. The issue of smokers from the Tavern has been referred to the Police. 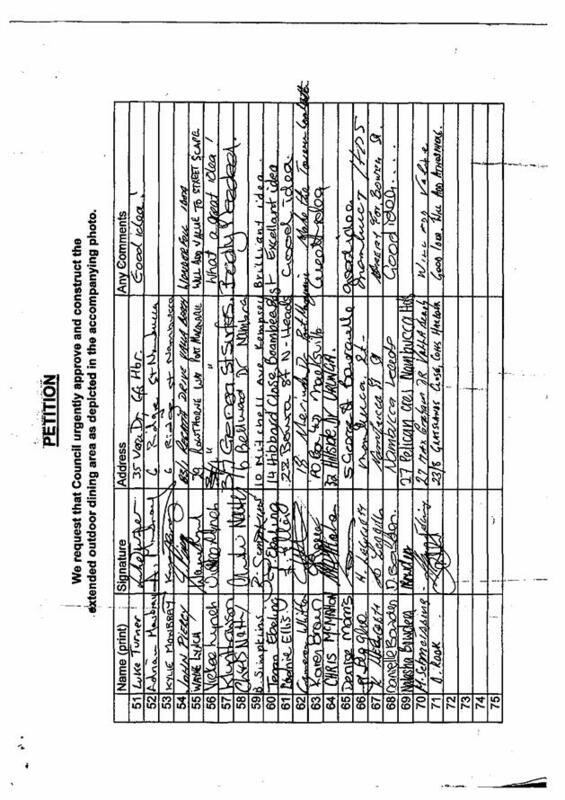 A copy of the petition is attached. 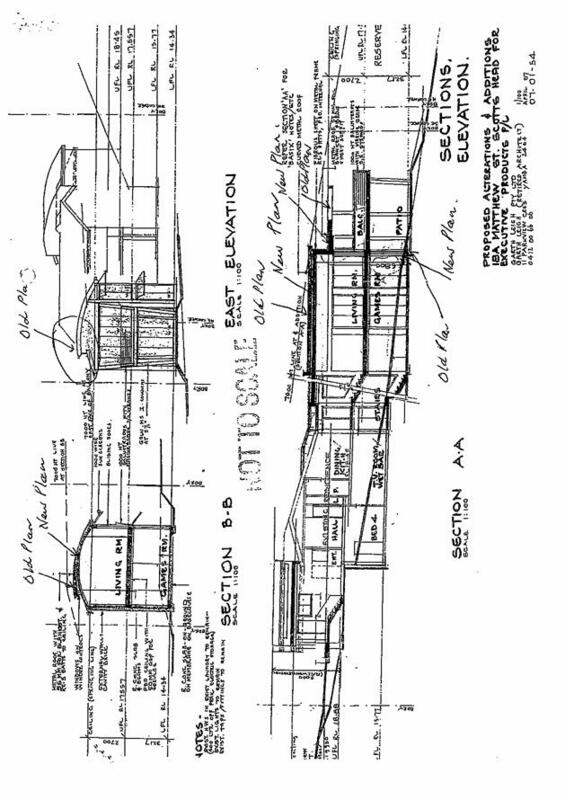 Plans and concepts presented to all parties. Social—Provides improved facilities for shoppers in the main street of Nambucca Heads. Economic—May contribute to greater number of shoppers in the Nambucca Heads CBD. Risk—The platform may have to be relocated if business use changes. The platform will have to be protected from traffic. The platform will cost $10,000 to be constructed and installed. This funding is available within the projected costs of the Bowra Street upgrade. The platform is constructed of a steel frame with timber decking and will need annual maintenance costing around $250 in future budgets. Existing funds available and no variation required. The phased introduction of a lease fee will generate income towards maintenance and future replacement.